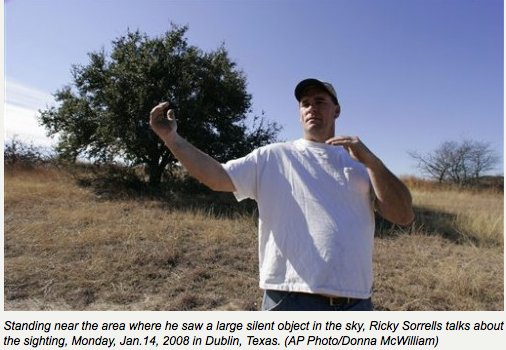 Hundreds in Stephenville and Dublin, Texas report seeing large UFO. (AP) In this farming community where nightfall usually brings clear, starry skies, residents are abuzz over reported sightings of what many believe is a UFO. 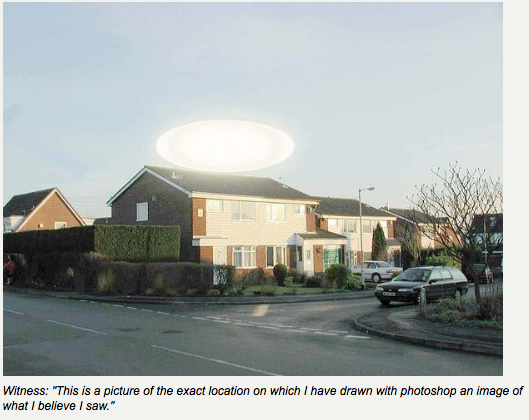 Several dozen people - including a pilot, county constable and business owners - insist they have seen a large silent object with bright lights flying low and fast. Some reported seeing fighter jets chasing it. Sorrells said he's seen the object several times. He said he watched it through his rifle's telescopic lens and described it as very large and without seams, nuts or bolts. Maj. Karl Lewis, a spokesman for the 301st Fighter Wing at the Joint Reserve Base Naval Air Station in Fort Worth, said no F-16s or other aircraft from his base were in the area the night of Jan. 8, when many sightings were reported. Lewis said the object may have been an illusion caused by two commercial airplanes. Lights from the aircraft would seem unusually bright and may appear orange due to the setting sun. Officials at the region's two Air Force bases - Dyess in Abilene and Sheppard in Wichita Falls - also said none of their aircraft were in the area last week. The Air Force no longer investigates UFOs. 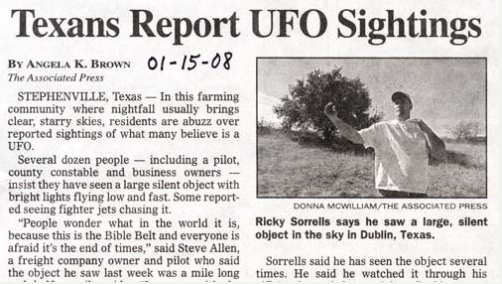 UFO sightings have been reported all over the world for centuries, including the infamous 1897 crash of a cigar-shaped object near the tiny Texas town of Aurora. While some thought it was a hoax, decades later investigators from UFO groups said evidence suggests the disfigured pilot's body buried that day was an alien. In Chicago in late 2006, some United Airlines pilots and other employees reported seeing a saucer-shaped craft hovering over O'Hare Airport before shooting up through the clouds. But federal officials said nothing showed up on the radar and explained it as some type of weather phenomenon. In 1997, dozens of people saw lights in a V-formation over Phoenix, a mystery that was captured on videotape and spurred calls for a government investigation. A few months later people reported a similar sight over Las Vegas. One of the most famous cases was the 1947 crash on a ranch near Roswell, N.M. Although the government said it was a top-secret weather balloon, an Army officer who helped recover the debris came forward 30 years later claiming a cover-up, asserting that an alien spacecraft had crashed. Reports later surfaced that a base nurse told someone that autopsies were performed on aliens from the wreckage. 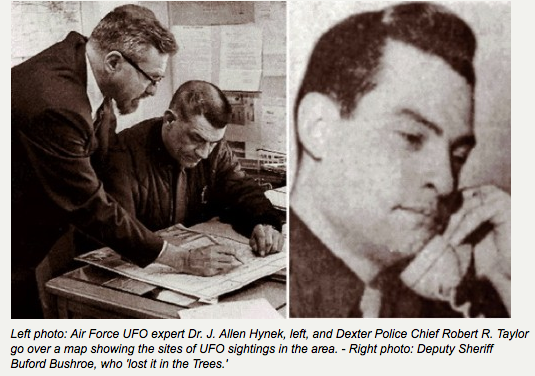 A few months after the New Mexico incident the U.S. Air Force started Project Blue Book, which investigated more than 12,600 reported UFO sightings - including 700 that were never explained - before the program ended in 1969. 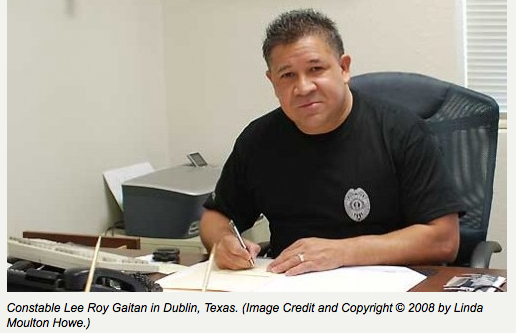 Erath County Constable Lee Roy Gaitan, who said he isn't sure about the existence of UFOs, said one night last week he first saw red glowing lights and then white flashing lights moving rapidly across the sky. "I didn't see a flying saucer and I don't know what it was, but it wasn't an airplane and I've never seen anything like it," Gaitan said. "I think it must be some kind of military craft - at least I hope it was." First let me say I am a police officer in the Metro-Denver area and have been for 26 yrs. My wife and I were at John Martin State Park. There had been a drowning the previous week and portions of the lake were closed off since the Park Rangers had not recovered the body of a 17yr that had drowned. There was alot of government activity at this time from state,federal, and county personnel. The navy had flown in a special sonar to try help locate the body of the victim. The incident that was witnessed by my wife and I took place on a camp ground called Point Overlook. We were in our RV and were the only ones at the campgound excluding a Park Ranger in a vehicle approximately 2miles away. We were approximately 300 hundred feet from the lake and approximately 30 feet above the water on a bluff overlooking the lake, hence the name of the campground. My wife had just retired to the bed and I was in the process of securing the RV as we planned to get up early and go fishing. This a lake with approximately 3500 acres of surface water and a fairly large concrete dam. This lake is approximately 8 miles long and 1 mile wide. We were camped approximatley 4miles from the dam. I first saw a bright light comming from the dam heading west. I initially thought it might be a helo looking for the drowning victim as early in the day the authorities had used an airplane and dive teams. This light came closer it became apparent that it was not a single light but six lights strung together. The first was white with the succeeding lights red blue red blue and amaber at the end. It appeared that the lights were connected by some sort of stucture. I estimate the length of these lights to be 600 feet in length. I yelled at my wife to get up. She did in time to see the lights stop directly perpendicular to our RV. The lights were directly over the lake, altitude approximatley 500ft distance to object was 500ft. The lights stopped and rotated. I was in the process of getting the camera and bicnoculars and wife was w! atching the lights. I did not seet the lights stop and rotate she did. 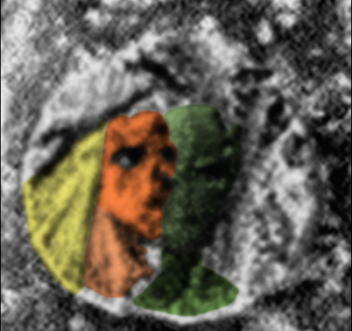 She states that when the craft rotated she could clearly see that it was a craft disk in shape with a dome stucture on top. She also stated that what we thought were lights were windows with lumanting lights from inside the craft. By the time I turned around the craft "winked" out. That is the best description I can give for its rapid disappearance. The whole thing lasted no more than 5-10 seconds for me. I had an opportunity to talk to the Park Ranger that was 2 miles away the next morning and she asked me if I saw anything unusal. I told her and asked her if she saw anything. She said that in the past week they all have seen stange lights in and aroung the lake. She also said that they talk amoung themselves but that supervision frowned on making any offical report. An off duty Huntington officer was warming up his car when he saw it first. He radioed for an extra set of eyes; he got two. Two fellow officers looked skyward and saw it, too. All three are Huntington law officers, guys who have seen just about everything. But this time, they didn't know what they were seeing. They're hoping someone else might have been looking toward the sky shortly after 2:30 p.m. Friday, Dec. 26, and can at least compare notes, if not provide an explanation. The object, seen from just north of the city Police Station, came out of the northwest to the steeple of a near by Catholic Church, then shot straight back north. It didn't make any noise, and it remained in their sight for less than a minute. But it was big described as the size of a hot air balloon or a backyard trampoline and low enough that one officer thought it was going to get hung up on the steeple of the church. Normally, such an object passing over the city would have lit up emergency lines. But this one didn't. No one called 911; no one called city or county dispatch; and no one called the State Police. The three officers may have been the only ones to see it. And for a few days, they didn't say anything about it. "We thought people would think we were crazy," one said. But now, curiosity has the best of them. Did anyone else see it? And what was it? The officer making the original sighting had finished his shift at 2:30 p.m. the day after Christmas and was warming up his car, parked across police station. He was sitting in the car, facing north. "It came from a long ways off," he said, describing the sighting a week later. "First it looked like a parachute that you can steer, black and curved, but there was nobody in it. It started rolling, a slow roll, and turned upside down. Then it looked like a giant set of bird wings. It did more rolls, and turned into an oblong circle that was orange. It wasn't any kind of flying machine that I can think of, and it's not like a '50s flying saucer. It was that big, but it didn't have a hump in the middle." The second officer who answered the call said his first impression was that it was "a tire" in the sky, but that made no sense. The first officer said the object changed shape three or four times. It moved in a straight line, tumbling as it moved, and made no noise. The third officer to verify the sighting had just walked out the stations backdoor, heard the radio traffic and looked up. "It was so big, within no time at all I spotted it," he said. 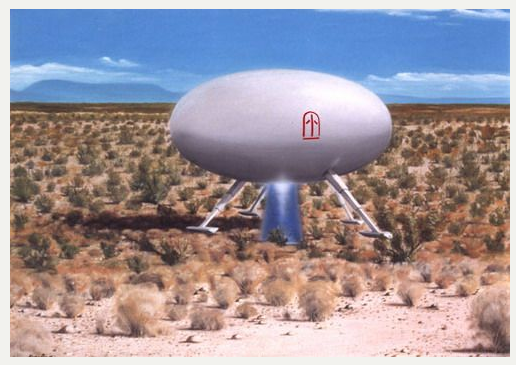 "When I first saw it, it was going in a flat plane, hovering, moving slowly right toward the church. It would glide, rotate the wide way around, and stay at one level, then it stopped, began moving in a circular motion, and turned bright orange. It went flat again, and hovered over the steeple". The officers believe the object turned orange when it reflected the sunlight, like a compact mirror would if you twirled it. It appeared to be moving along at treetop level, no higher than the roof of the church. It disappeared from the first officers view after it went behind the church steeple, but the other two officers who had slightly different vantage points said it went behind the steeple and moved directly north. The second and third officers were 30 to 35 feet apart. The agreed the sighting lasted 30-45 seconds. Other statements included the object was completely circular, dome shaped. "I can't imagine how it could possibly be anything I could relate to. The object would stop and then spin slowly, a maneuver no known aircraft can accomplish. I was never really afraid, just in total amazement." The pastor of the Catholic Church, said he didn't see anything unusual that afternoon, and hasn't received any phone calls from anyone who did. "That's the first I've heard of it," he said Friday. Managers at the Huntington Municipal Airport and Fort Wayne's Smith Field said there were no records of any out-of-the-ordinary craft making either a takeoff or landings. 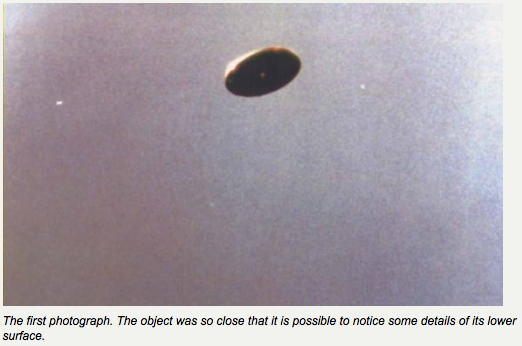 Investigators Comments: The description of the object's movement is not unreported in the annals of UFO sightings. It's pretty common that such an reported object comes over, stops and hovers. This is not the first time a tumbling motion has been reported, and then it moves off. The size and movement of the object have eliminated most common possibilities. Investigation still in process. We were driving west in the afternoon into Vancouver on the #1 freeway. And in a clear sky overhead and to the south was a black object in the oval shape of a rugby ball! It was not moving and stayed exactly where it was as we approached. It seemed to be about 2000 feet above the ground near our Central Park and about the size of a 747. Many people pulled off the highway to look at it, including 2 policemen. It did not move at all and was not a balloon or kite. In retrospect, the oval shape could have been a circle shape as viewed from an angle. It seemed like the opening of a round pipe. We rushed home expecting to hear breaking news but nothing was said about it. I can see the area from my apartment and looked with binoculars after getting home but saw nothing and wondered if my angle of view now was parallel with the shape so it would be a straight line if in fact it was a flat opening of some kind like a disk? I would love to hear what it could have been. Brian, thanks for your reply. 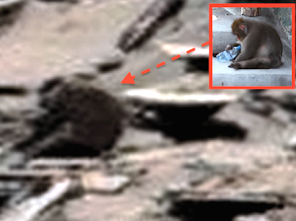 Please be clear about the included picture; that I used Photoshop to duplicate as close as I could to show what I saw. My wife saw it as well, and it seemed like it was in the area west of Central Park, south of Kingsway. And could have been about 1000 to 2000 feet up. Our viewing angle was from the #1 freeway. We noticed it somewhere east of Willingdon Ave. interchange. It never appeared to be hovering, or moving at all or affected by wind or anything. It was definitely NOT a balloon or kite. Just solidly stationary in the sky. As if it was a flat plane of black disk, not even an edge to it. Nor did there appear to be any structure or shape to it other than the solid black disk. No light reflected off anything. As we got just past the Willingdon exit, the traffic slowed down and we pulled to the side of the road as others did. There were even two RCMP officers stopped on a side road, (on what I think might be called Clydesdale St. which leads onto Grandview Hwy at Boundary Rd) they were out of their police car looking up at it too. Other traffic had slowed. I passed by and went home, listening to the radio for reports, but there were none. I even expected the 6 PM news to have video. When I got home, I live in a high rise in Vancouver and could see in that direction east, Central Park is directly in my eastern view, I got out my binoculars but could see nothing. I accounted that to the fact that I thought it was a flat object, and from my new view, it would only be a line in the sky if it was still there at all.. The thought did come to mind that it could have been a circular shape, if viewed directly from below, however I never went closer to find that out. When I told some others about it, someone suggested it could have been a "black hole". I DO know what a real black hole is, but that was an apt description of what it appeared like. As if a pipe was there for some reason, and we could only see the hole in the pipe, but not the pipe itself. I wonder if you'd get any interest from the RCMP office near the Gaglardi Way? Caribou Rd exit? I just discovered your website recently so can't exactly recall the month I saw it, and it could have even been 2002. Of course most people just smirk when you tell them and ask if I'm a 'trekkie' too, but it was a phenomenal and unforgettable sight. It would be most interesting to find others who saw it too. Although I was with my wife at the time, a serving police officer, and we both agree that we saw it. It is disturbing to me that we both seem to have a different recollection of when and where we were when we both observed it, a difference in time of apparently only a few hours. I believe we saw it at about 12 noon however my wife believes she observed it with me later in that afternoon at about 1600 hoursand in a different location. A few days later I decided to go and photograph the same location where I believe I had observed it and with the aid of photoshop I was able to recreate a copy of what I believe we saw. Can sighting be explained as any conventional man-made or natural object? 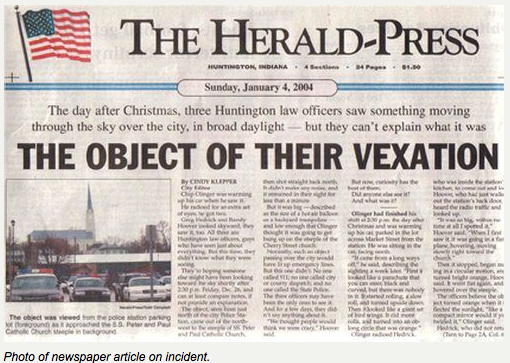 Illinois Triangle UFO Sighting by many police officers. 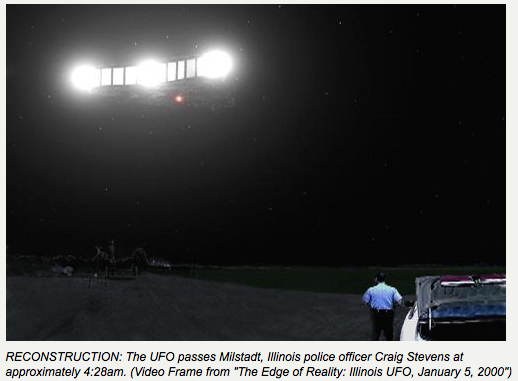 "Illinois police officers track UFO near Scott AFB"
Noll was returning from a delivery run he had just completed at approximately 4 a.m. on Wednesday, Jan. 5. Before returning home, he thought he would check his miniature golf course and make sure everything was in order. He parked his truck in the back of the building and began to exit the vehicle. While doing so, he noticed a "bright star" over in the northeast sky. He didn't give it much thought at the time and proceeded to enter the building, After checking things inside, he was returning to his truck when he again noticed the "bright star" in the northeast sky. This time he stopped and observed it more closely. This object had a series of "windows" that ran down the side. He also noticed two "floors," each having two "windows." These were described as rectangular with an intense white light radiating out from them. 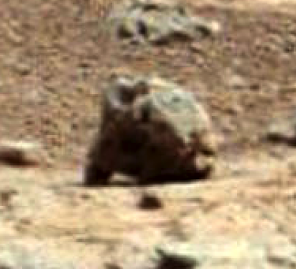 The "windows" appeared to be located more toward the rear of the object. When the object was very close, Noll stated he could see a large number of dim red lights on the bottom. He assumed the exterior color must have been black or dark gray. The description he used to initially describe the object was "like a two-story house" in the sky. During this time, Noll did not notice any sound, odor, or emission coming from the object. 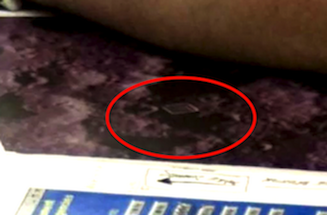 As it moved away to the southwest he noticed "windows" on the back of the object. He added that these appeared to have a series of lines or bars in them that ran up and down. Noll promptly drove his pickup truck to the Highland Police Station. He thought that nobody would believe him unless the Highland Police could contact a neighboring town's police officer who could verify that there was something strange in the sky. The dispatcher at the Highland Police Department listened to Noll's account and determined that he was a rational individual, despite his unusual claim. She then contacted the Lebanon Police Department. Officer Ed Barton responded to the call around 4:10-4:15 a.m. 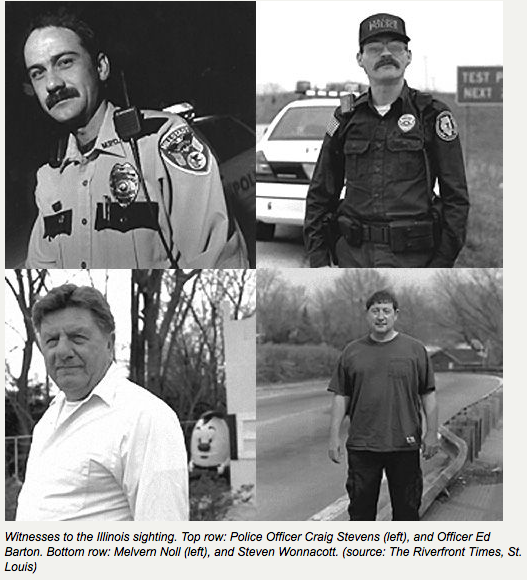 Upon arriving at Illinois Route 4, Officer Barton turned south, heading back towards Lebanon. He was able to observe the lights to his left through his driver's side window as he was proceeding into town. At some point, as he was alternately watching the lights and the road in front of him, the two bright lights now appeared to be one bright light. At this point, he switched on his overhead lights, now believing this could possibly be an aircraft having problems. Officer Barton stopped his vehicle on the side of the road, because he now noticed the object appeared to be heading in his direction. He stated it was not moving very fast, but not very slow either. Upon stopping the vehicle, he turned off all the lights and his squad car's radio in an attempt to hear any noise possibly coming from the object. No noise was evident. He was able to observe the rear of the object before this display of velocity, and his best analogy is in comparing it to the Millenium Falcon spacecraft from the motion picture "Star Wars." It appeared to be rectangular and illuminated by white light. Through the middle of the light, running lengthwise, was a band of multi-colored illumination. He stated that there were no individual colored lights visible. Rather, it appeared as a band of various colors, which blended into each other. He continued the transmission by informing Central Command that the object should now be around the town of Shiloh, approximately 8 miles to the Southwest. Officer Martin was driving on the southern end of Shiloh heading east when he observed the mysterious object, which appeared to be heading in a westerly direction. He was able to observe three brilliant white lights, which were shining downward from the object. However, the light did not illuminate the ground or objects on the ground. 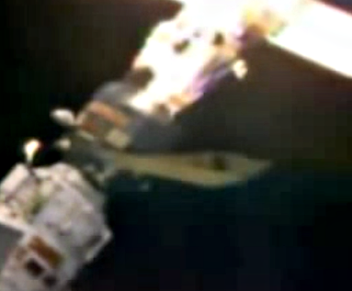 In addition, small red and green lights were observed on the back end of the object. At this time, Officer Martin thought the object's altitude was approximately 1,000 feet. He estimated the distance from his car to the object to be about a quarter of a mile. He thought the object resembled the shape of an extra wide triangle or arrowhead. 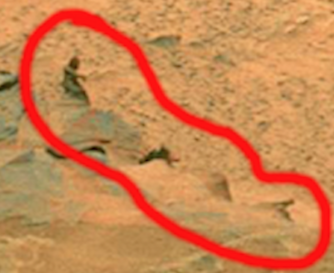 He estimated the apparent size to be 75-100 yards wide (Figure 3). Officer Martin was driving slowly during his observations. He also rolled down his driver's side window to determine if the object was emitting any sound. No sound could be heard. He finally decided to pull over to the side of the road and exit the vehicle for a better observation. At this point, the object increased in speed and disappeared in a westerly direction. Officer Martin estimated the object's initial speed to be 15 mph. When it increased in speed, he figured it to be at least 80-100 mph. While sitting in his car, he observed a very large object that was roughly triangular in shape. Officer Stevens estimated the object to be only 500-1000 feet in altitude. The flight speed was described as extremely slow. He also stated that there was no noise with the exception of a "low decibel buzzing sound" that he could barely discern. As he watched the object, it began moving to the north. It had a white light on the left side, right side, and center of the back end. In addition there was a single red light on the bottom. The back end also appeared to be slightly recessed. At 4:29 a.m. Officer Stevens contacted his dispatcher to advise him that he could now see the object. Then he exited his vehicle and grabbed the Polaroid camera from his squad car's trunk. He aimed the camera at the object and took a picture, but the extreme cold temperatures of that morning (15-20 degrees Fahrenheit) caused the camera to work poorly. He was able to produce one photo, though poor in quality, before the object disappeared to the northwest. Approximately five minutes after Officer Stevens' radio transmission from Millstadt, the Dupo officer observed an array of lights. Contrary to the other officers, this individual stated the object was at a relatively high altitude and proceeding in a north-northeasterly heading. It was so high in the sky that the officer said he wouldn't have noticed it if it wasn't for the radio traffic. He said it stayed east of Dupo. 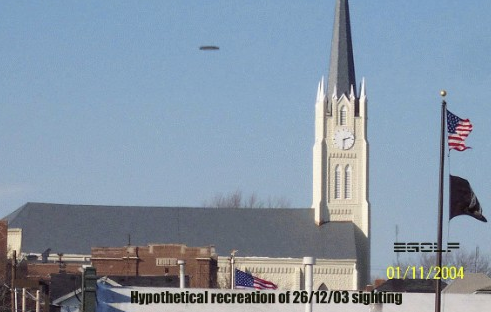 These witnesses provide us with enough data to project the flight path of the object as it traveled over the Southwestern Illinois area (Figure 6). It apparently came from the northeast and traveled slowly over Highland to Summerfield. Once there, it turned to the southwest and drastically accelerated. It traveled approximately 1-2 miles north of Scott Air Force Base and slowed as it passed over Shiloh. I promptly received a courteous, albeit uninforma-tive, letter of response indicating that (1) the only calls received at the base were from the media, (2) no ground observers at the base have come forward with reports, (3) the base did not track any objects on radar, since radar services are provided by the FAA at Lambert-St. Louis International Airport, and (4) the base was not operating any craft resembling the reports . Also be advised the last thing that went over Leba-non-this was approximately five minutes ago—was a military cargo plane. It looked like a C-5. .. .Be advised there is a very bright white light east of town. It looks like it's just east of Summerfield, and it keeps changing colors. I'll go over there and see if it looks like an aircraft. It doesn't look like an aircraft, though.... It's not the moon, and it's not a star. Whether it's a plane or not, it's heading westbound now. It should be really close to Scott now.... As a matter of fact, if the Shiloh officer looks up, they can probably see it by now. Shiloh officer: I see something, but I don't know what the heck it is.... It's probably heading to Lambert (Field). Dispatcher: Does it look like a-What does it look like to you?" Millstadt officer: It's kind of V-shaped. It looks like it's possibly headed toward Lambert. Dispatcher: 10-4. That's what Shiloh said when it was heading towards Fairview Heights. Dispatcher: That, I don't know. Dupo officer: I'm not sure what you're seeing. It appears to be pretty high in the area. When I could first see it with binoculars, you could see it was different colors. Now it appears to be white. Dupo officer: It's hard to tell. It's pretty far off. Dupo officer: This thing appears ... it's probably 20 or 30,000. It's about where planes usually are. It's not low at all. One of the major problems relating to this is the issue of perspective. 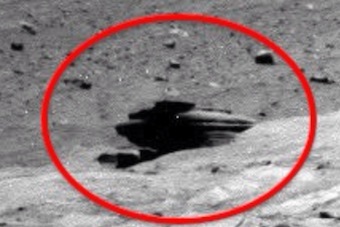 From what perspective did the witnesses view the object? Some witnesses were stationary, while others were driving at the time of their sighting. In particular, Officer Barton's descriptions vary as he views the object from different distances and angles. To compound matters, the object was moving at various speeds and directions in relation to the observers. Another issue that needs to be discussed is Scott Air Force Base. I find it hard to imagine that a large unknown object with bright lights could fly under 1000 feet within two miles of the base without causing some concerns. I believe they may have more detailed information concerning this event. 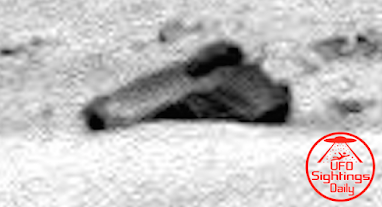 It is a distinct possibility that the object witnessed was a military craft of some type. Unfortunately, we do not have any evidence to support or refute this idea. In closing, I would like to extend my thanks to Peter Davenport of the National UFO Reporting Center for his invaluable assistance in this case. Also, my thanks to the witnesses who were willing to come forward and share their experiences with us. Thanks, also to Forest Crawford who directly assisted me. I'm a police officer on the midnight shift. I also hold a commercial pilot's license, and have extensive military experience regarding flight training at night (aided and unaided). October 27, 1997 at 3:40 am, I was standing outside my patrol car in an unlit parking lot facing west. A flickering movement in the night sky drew my attention skyward. I observed an aircraft, approx. 150-200ft above ground level and approx 300-500ft slant range from my location. It was rolling out of a right bank and the streetlights were illuminating it enough so that I could see a distinct silhouette of the fuselage and the underbelly. 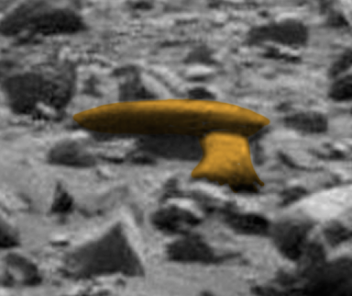 This object appeared to be the same color as the night sky, flat black or dark gray. There were no lights, no exhaust flames and no engine noise... just absolute silence! 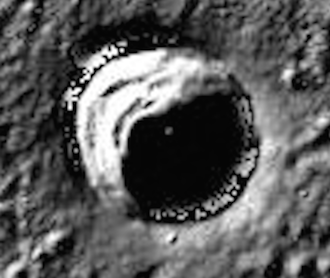 There were numerous circular protrusions spread symmetrically across the bottom. I estimated the craft to be approx 70ft long, 30ft wide and 10ft high. When it rolled out of its bank, it disappeared southbound no faster than 100 knots. The total time of this sighting was approx 10-15 seconds. Afterward, I was left with an ominous feeling one would get from such a portentous presence. Two Jefferson County air unit police officers — described by their lieutenant as "solid guys" — swear they had a two-minute dogfight with a UFO during a routine helicopter patrol Friday night. Two officers on the ground said they, too, spotted the object. The UFO — a glowing pear-shaped object about the size of a basketball — literally flew circles around the helicopter, even though the fliers say they were moving at speeds approaching 100 mph. In one blinding moment when both craft were hurtling toward each other, the UFO shot three baseball-size fireballs out of its middle, all three officers said. The fireballs fizzled into nothing. 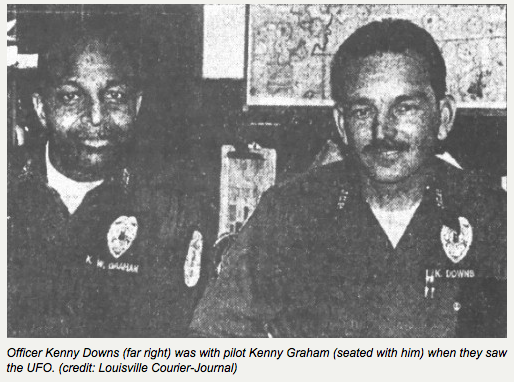 Officers Kenny Graham and Kenny Downs haven't talked much about their Friday night flight over General Electric Appliance Park because they fear few will believe them. But they are convinced they weren't hallucinating. "We both go to church every week," Downs said as a way of explaining how normal the two normally are. "In fact, I might start going to church twice a week." Officer Mike Smith, in his squad car below, said he saw the object for only about a minute. But he confirmed the UFO shot three fireballs into the air and then disappeared. Officer Joe Smolenski said he tried for more than a minute to catch up to the object in his squad car. "I've been looking for 'em for 14 years, and I guess this is the closest I've come to something I couldn't explain." Lt. David Pope, who was roused out of bed at 12:30 Saturday morning by a call from the startled officers, attested to their sanity and sincerity. "These guys are totally solid guys," Pope said. "There's no doubt in my mind there was something out there." The night started out like every other night. Graham and Downs got to work around 6 p.m. and were soon in the air flying a routine patrol. Graham, 39 and an 11-year veteran, was the pilot. Downs, 39 and a five-year veteran, was the spotter. While in the air, they received a call about a possible break-in near Sanford Avenue and Buechel Bank Road. They flew off and quickly reached the area, which is near the northeast comer of Appliance Park, around 11:50 p.m.
As they circled, Graham saw something that looked like a small fire off to his left. Dozens of bonfires had been lit around the county that night by revelers delighting in the new snowfall. But Graham soon decided i! wasn't a fire. 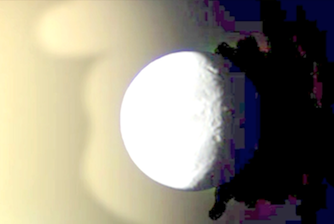 Downs shined his 1.3-million-candlepower spotlight on the object, which began to drift back and forth like a balloon as the light washed over it. Then it gradually floated up to the helicopter's elevation about 500 feet above the ground, where it hovered for a few seconds. "Then it took off at a speed I've never seen before," said Graham: an experienced pilot. The object made two huge counter-clockwise loops and finally approached the helicopter's rear. Graham, afraid-the object would ram his tail rotor, pushed his speec above 100 mph. 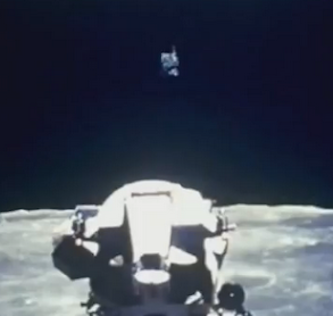 The UFO shot past them and instantly climbed hundreds of feet in the air. It descended again and flew close to the helicopter. Graham tried to close the gap with the object, and it again flew away. As the UFO approached on a parallel course, the three fireballs burst out of its core. Scared, Graham banked away from the object. "When we came back around, it was gone," Graham said. When the two returned to their base, Graham called the control tower at Standiford Field to ask if their radar had spotted anything unusual. It had not. Downs called the county's radio dispatchers to ask if anyone else had reported sightings. No one had. But the two did get confirmation from two officers on the ground, one of whom was Smith. "I have no idea what it was," Smith said, but his confirmation cheered the two fliers. "It makes me feel better," Downs said, "that there are... grown men out there who are sworn to protect this community and who saw the same thing." The Chief of Operations of the Royal Belgian Air Force, Colonel Wilfred De Brouwer (now Major General and Deputy Chief of the Belgian Air Force), set up a Special Task Force Unit to work closely with the Gendarmerie to investigate the sightings as soon as they were reported. Among the thousands of witnesses were many military and police officers, pilots, scientists and engineers. 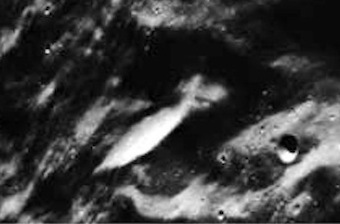 The wave was documented by the Belgian Society for the Study of Space Phenomena (SOBEPS), a private organization from Brussels, which published two thick volumes on the UFO wave. 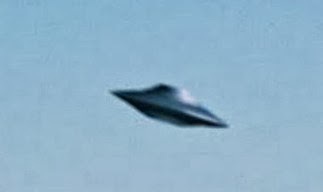 "On November 29, 1989, a large craft with triangular shape flew over the town of Eupen. The gendarmes von Montigny and Nicol found it near the road linking Aix-la-Chapelle and Eupen. It was stationary in the air, above a field which it illuminated with three powerful beams. The beams emanated from large circular surfaces near the triangle's corners. In the center of the dark and flat understructure there was some kind of 'red gyrating beacon.' The object did not make any noise. When it began to move, the gendarmes headed towards a small road in the area over which they expected the object to fly. Instead, it made a half-turn and continued slowly in the direction of Eupen, following the road at low altitude. It was seen by different witnesses as it flew above houses and near City Hall." BELOW IS A REAL VIDEO OF THE US AIRCRAFT TR-3B IN FRANCE. "The aircraft had brief radar contacts on several occasions, [but the pilots]... at no time established visual contact with the UFOs... each time the pilots were able to secure a lock on one of the targets for a few seconds, there resulted a drastic change in the behavior of the detected targets... [During the first lock-on at 0:13 hrs.] their speed changed in a minimum of time from 150 to 970 knots [170 to 1,100 mph and 275 to 1,800 km./hr.] and from 9,000 to 5,000 feet [2,700 m. to 1,500 m.], returning then to 11,000 feet [3,300 m.] in order to change again to close to ground level." The Electronic War Center (EWC) of the Air Force undertook a much more detailed technical analysis of the F-16 computerized radar tapes, led by Col. Salmon and physicist M. Gilmard. Their study was completed in 1992 and was later reviewed by Professor Meessen. 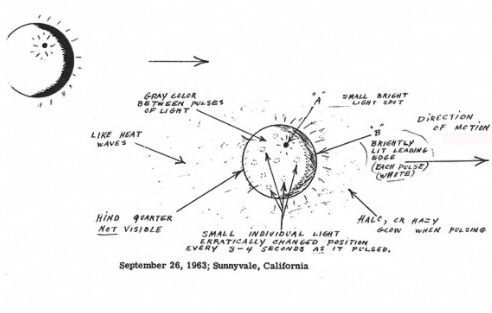 Although many aspects of this case still remain unexplained, Meessen and SOBEPS have basically accepted the Gilmard-Salmon hypothesis that some of the radar contacts were really "angels" caused by a rare meteorological phenomenon. This became evident in four lock-ons, "where the object descended to the ground with calculations showing negative [emphasis added] altitude... It was evidently impossible that an object could penetrate the ground, but it was possible that the ground could act as a mirror." Meessen explained how the high velocities measured by the Doppler radar of the F-16 fighters might result from interference effects. He points out, however, that there is another radar trace for which there is no explanation to date. As for the visual sightings of this event by the gendarmes and others, Meessen suggests that they could possibly have been caused by stars seen under conditions of "exceptional atmospheric refraction." "We always look for possibilities which can cause errors in the radar systems. We can not exclude that there was electromagnetic interference, but of course we can not exclude the possibility that there were objects in the air. On at least one occasion there was a correlation between the radar contacts of one ground radar and one F-16 fighter. This weakens the theory that all radar contacts were caused by electromagnetic interference. If we add all the possibilities, the question is still open, so there is no final answer." "Sound effects (faint humming... to total silence)." "Unfortunately, no explanation has been found to date. 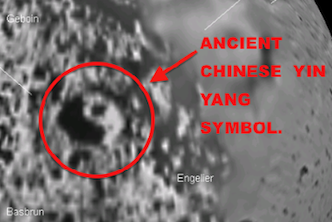 The nature and origin of the phenomenon remain unknown. 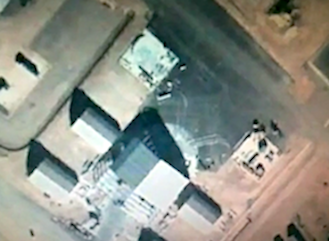 One theory can, however, be definitely dismissed since the Belgian Armed Forces have been positively assured by American authorities that there has never been any sort of American aerial test flight." 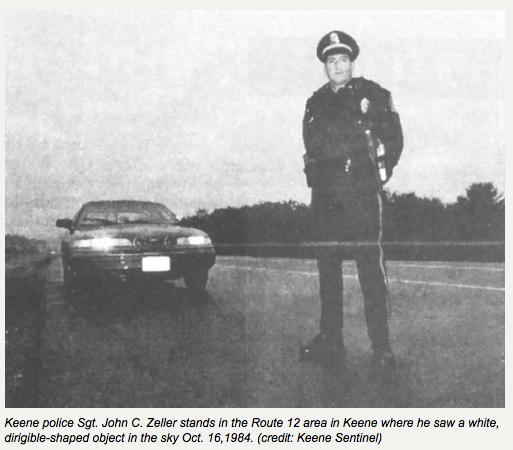 Among N.H. UFO believers, it's known simply as "The Zeller Incident." 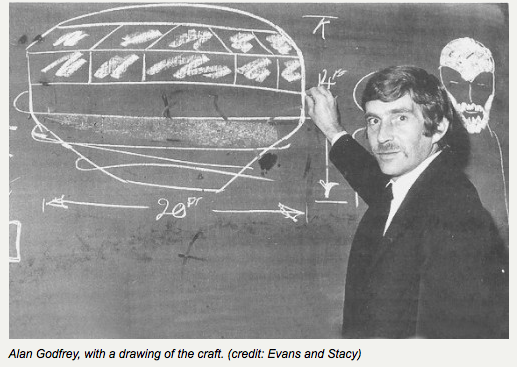 On Oct. 16,1984, a mysterious craft was seen over Keene near Route 12. Keene police Sgt. John C. Zeller got the call and drove out to the highway to see what was going on. He caught sight of something in the sky and shined his cruiser's spotlight on a white, dirigible-shaped object before it moved off. The following night it was back, hovering above Keene again. A lot of people reported something strange during those two nights. 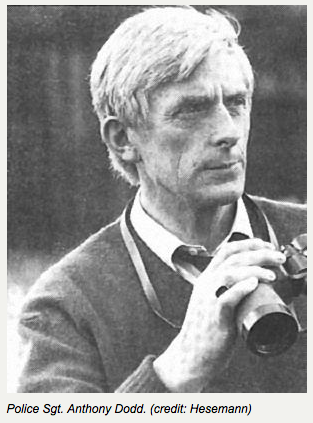 But the sighting was named after Zeller, probably because of his position in the community. He even went on television to detail what he had encountered. To this day, Zeller — who's taken a bit of flak over the years about his public account — maintains the object was unlike anything he'd ever seen. Still, he knows what he saw. It did not behave like any known aircraft. It defied physics, and it was huge. On the night of Oct. 15, the Keene, N. H. police got an anonymous phone call. The man refused to give his name because he said his wife would think he was crazy. He told the police something strange was hovering over the city. A skeptic familiar with crank calls, Sgt. John Zeller was in no hurry to reach the section of Route 12 where the object was reported. As he drove from West Street to Route 12, the car coming toward him screeched to a stop, and two people got out, pointing at the sky. "There was something, mostly lights, hovering five to 700 feet off the ground, red, green, white pulsating types," Zeller says. "All you could see was the lights, you couldn't see any outline. The strange thing was, this was absolutely still, like it was stuck there. There was no sound. I stood there probably two minutes." Then Sgt. Zeller aimed his 200,000 candlelight power spotlight at the hovering lights. "You could see the light beam through the dark," Zeller says. "The minute the light beam was put on it, it came toward it, at an angle, lowering at the same time. It was so clearly unconventional. The thing kept coming about 100 feet from the cruiser, traveling as fast as you'd ride a bicycle." The strange craft hovered over the cruiser, barely moving. Zeller saw no markings, no openings, and can't remember if he saw wings, but he described the object as 40-50 feet long, 10-15 feet wide, cream-colored with blunt ends, ridged on the bottom like an old-fashioned bathtub. "It gave out a two-tone hum," Zeller says. "It went over to a car wash and it did something which I assume was turning around, then it went — boom — over toward the Ramada Inn." Zeller admits he'd never seen anything like the thing that hovered over his cruiser the night of Oct. 15, 1984. "It doesn't mean it came from Mars," he says. 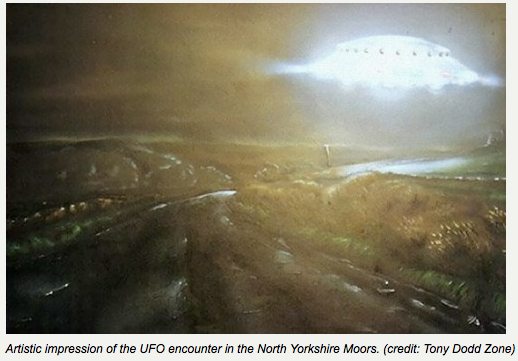 In November and December 1980, the eastern side of Britain was experiencing a major UFO sighting wave. There were chases of UFOs by police cars near the coast, a UFO that overflew an oil rig in the North Sea, and the wave culminated in the famous events on the East Anglian coast at Rendlesham Forest. Just a month before these landings beside those NATO air bases, one of the most impressive alien abduction cases took place in the small Penninemill town of Todmorden, West Yorkshire, right in the centre of Britain's most active window area known locally as "UFO Alley". Godfrey turned around and examined the spot where the UFO had hovered. The road was very wet as it had rained heavily earlier in the night. But just at this one location was a circular patch where the roadway had been dried in a swirled pattern. Only when back at the police station did he realise that it was a little later than he had expected - although any missing time was probably no greater than 15 minutes from estimates later taken on site. Concerned as to possible ridicule, Godfrey at first chose not to make an official report, but changed his mind later that day when he discovered he was not alone. After breakfast that morning, a driver who had been on Burnley Road three miles further out at Cliviger reported seeing a brilliant white object and contacted Todmorden police. The time matched that of Alan Godfrey's. Furthermore, a police patrol from an adjacent force (Halifax) had been engaged in a stakeout for stolen motorcycles on the moors of the Calder Valley and had witnessed a brilliant blue-white glow descending into the valley towards Todmorden shortly before Godfrey experienced his close encounter. Their story, when it reached Todmorden police station, formed a second match. Although Alan Godfrey had no further conscious recall of the missing time, he did have increasingly confused memory of the sequence of events surrounding the sighting (with an unexplained image of seeing himself outside the car during the sighting). There was also puzzling physical evidence. His police-issue boots were split on the sole, as if he had been dragged along the floor and they had caught on something. He also reported a previous history of seeing other strange things and having experienced at least one earlier time lapse as a youth—factors that UFOlogists have come to recognise as common with abduction cases. The hypnotic testimony is very odd, and Godfrey was never to be sure what really happened. Under regression he told of the bright light stopping the car engine, causing his radio and police handset both to be filled with static and then to be swamped by blinding light as he lost consciousness. His next recall was of being inside a strange room, more like a house than a spaceship, complete with a most unexpected large black dog. He was studied by a heavily bearded man who telepathically conveyed that his name was "Yosef" and whose clothing was very Biblical in nature. Assisting Yosef were several small robot-like creatures "the size of a five-year-old lad" and with "a head shaped like a lamp". 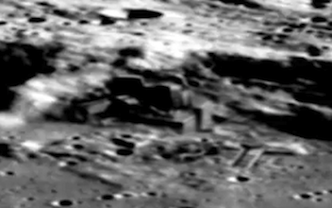 They are reminiscent of the "Grays" of UFO lore; although with major differences. Godfrey was supposedly asked questions, told that he "knew" Josef, and was promised a later encounter. But apparently he was not subjected to the more familiar indignities of abduction stories (especially from the US), such as bodily fluid samples and rectal probes. Although there were periods of missing memory, the hypnotic recall that did emerge was a curious hybrid of mythic images, UFO case elements and dream like sequences. Unhappily, Alan Godfrey suffered terribly after this encounter. When I first wrote up the investigation (just before the regression hypnosis began) for Flying Saucer Review magazine in 1981, I deliberately changed his identity to help protect him; although this was probably futile because the story had already been featured in the local press under Godfrey's real name. However, despite my refusal to assist them, a tabloid reporter traced the witness and devoted a front-page banner headline article to the story — read by millions over the Sunday lunch—which led to the officer being called to explain himself before his superiors. He was forced to undergo medical investigation to determine his "status", but was pronounced psychologically fit and healthy. Yet after some years feeling that he would never be allowed to forget his sighting, he took advice to honorably resign over an unrelated physical injury incurred during an incident in which he bravely intervened to avert a crime. Star-shaped objects had not been reported [in Germany] before they appeared for the first time in September 1979. They were observed for several nights over the city of Ingolstadt. Since that time members of MUFON-CES have interviewed several flight controllers, a dozen police officers and numerous other witnesses. They have also analyzed photographs and radar recordings that where made on film. On September 6, 1979, at about 9:30 p.m., a TV technician, Mr. Y. arrived at his home. He lives in the suburbs just outside of the city of Ingolstadt. A neighbor called his attention to three bright lights in the sky. 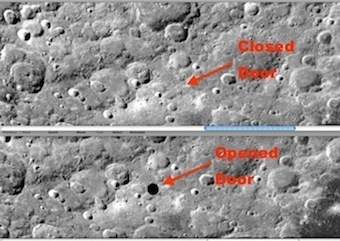 These three large (15 meters) objects hovered at an altitude of about 200 meters, approximately one kilometer away from his house. 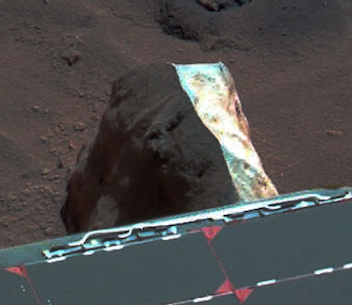 Their surface seemed to consist of metal, "like silver foil". The objects were surrounded by a bright light with white to yellow-greenish color. After a short period of time, one of the objects flew toward a big cubic shaped billboard. The name of the car company "AUDI" is displayed on all 4 sides. 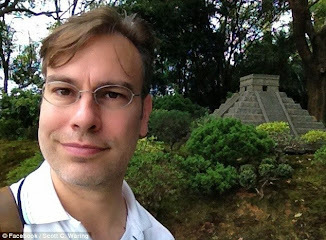 The cube is about 450 meters away from Mr. Y's home. The luminous object stopped about 70 meters above the cube. Witnesses recognized that the object had 5 points. Two of them pointed upwards, two pointed downwards and one pointed in flight direction. Red lights flashed around the points. After one minute the star shaped object flew back to the two waiting objects, forming a chain. This chain of lights then flew toward the billboard, in only 5 seconds, after which they continued in the direction of the city Eichstaett (about 25 km away from Ingolstadt). Mr. Y's observation lasted about five minutes. He called the police station in Ingolstadt-west as soon as the objects disappeared. The police had already received 6 or 7 additional calls from other eyewitnesses that same evening. At 9:45 p.m. the police officers in Eichstaett observed the objects, and at 9:53 p.m. police officers in Gunzenhausen (60 km north-east of Ingoistadt) also reported their sightings. Six minutes later police officers in Weissenburg (about 40 km north east from Ingoistadt) observed two strange lights at a high altitude. Eventually, at 10:01 p.m. the headquarters of the state police in Munich (70 km south of Ingolstadt) was informed of the sightings. The two police officers who had interviewed Mr. Y. were driving in their patrol car north of Ingoistadt. At 11:02 p.m. they encountered a 5-pointed luminous object which hovered at an altitude of 20°, approximately 2 km away. The object appeared to be the same size as the moon. It had a yellowish color and continuously showed flashing lights. One of the police officers Mr. F. later said: "I was amazed. I didn't believe in the whole mumbo jumbo. But suddenly that thing was there!" The sharp points shone in a bright orange-red color in non-regular intervals. Meanwhile the interior of the object continuously radiated as bright as floodlights. The witness got the impression, that the edges shimmered. The driver tried to find a better position for an unobstructed observation and got only a short glimpse of the appearance. Officer F., however, noticed that some light source on the edges of the object moved around with a frequency of about 3 Hz. This caused the shimmering of the edges and the flashing of the points. 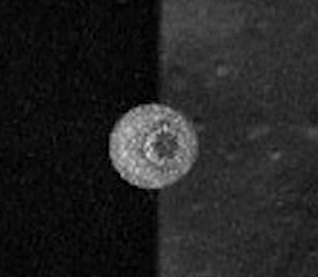 The object could be observed for about 10-15 seconds. When the patrol car reached a location from where the witnesses had an unobstructed view, the object had already vanished. At 11:22 p.m. two other police officers saw two luminous objects in Schwabach (10 km south of Nurenberg, and 70 km north of Ingolstad*). 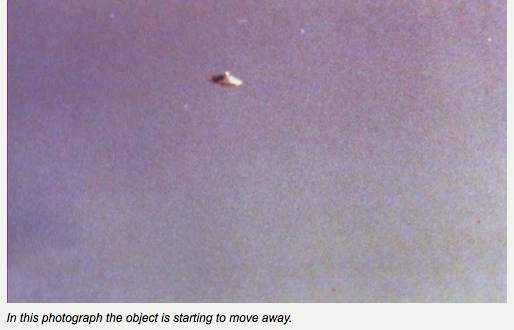 Two days later, on September 9, 1979, the pointed objects were again in that area. At about 8:30 p.m. witnesses in the city of Nurenberg observed an 8-pointed object flying at an altitude of about 1300 meters in a southerly direction. One hour later an oval object flashing red lights and dancing up and down was seen near Ingolstadt. Police officers from Ingolstadt again informed the state police headquarters in Munich. They in turn called the Federal Office for Air Traffic Control (BSF) in Munich-Riem and ordered the flight controllers to have a look for "UFO-related shapes over the area Ingolstadt". Flight controller H. had a Cessna 414 on his radar screen which was located 30 km north of the city Ingolstadt. He asked the pilot to look for any unusual lights in the sky. The Cessna had departed at 8:30 p.m. from the Munich Airport and was on the way to Brussels. Aboard were the owner of the airplane, Mr. K., and the female pilot. The airplane flew at an altitude of 3600 meters. At first, the pilot could not see anything unusual. Approximately 30 seconds after the call from the flight controller, she informed the tower in Munich-Riem, that she could now see several lights rising up from the ground in flight direction. Soon thereafter she reported very excited that 4 or 5 very bright lights were flying toward her. They each had 6 points and were yellow-green in color. As fast as the bright objects appeared, they disappeared again after about 30 seconds. The two passengers were so distraught that they had to make a stopover at the Frankfurt Airport. From there the owner called flight control in Munich to confirm everything that his pilot had reported. He explained that he didn't believe in UFO's, but these observed objects were totally unexplainable for him. The communications between the pilot and Air Traffic Control Munich was overheard by the military flight control at Furstenfeldbruck Airport. A police officer who overheard the conversation, later told his colleagues in Ingolstadt that the witness account sounded like the sound track of a science-fiction movie. The search and rescue helicopter "Pirol 203" which was requested by the police from the German Federal Border Protection, arrived in the area of Ingolstadt at 11:03 p.m. The pilot circled over Ingolstadt until 11:21 p.m. without discovering any unusual lights in the air. "Because of the unusual weather condition at the time in the area of Ingolstadt it came to mirages which were caused by the anti-aircraft fire from the military training area Hohenfels, and in some cases also by civilian aircraft's (document 315/79) ". The incident occurred on the frosty winter morning of December 12, 1978, not far from Skipton in North Yorkshire. At 4:30 a.m., a lonely police patrol car was driving on a remote country road along the Cononley Moor. In the car were Sgt. Anthony Dodd and Constable Alan Dale, who operated the radio. It was very dark and the road was lit only by the headlights of the car, the silence broken only by the noise of the motor and the occasional messages over the radio. Dodd loved that kind of mysterious stillness in the middle of a bare and unspoiled countryside, with dark houses snuggling up against the low hills as if seeking shelter from the cold winds, and the stone walls that divided the meadows from time immemorial. It was the land of sagas and legends, of witches and elves, spirits and wills-o'-the-wisp, which lured unfortunate wanderers in the moor towards inescapable death. There was a magic in the air which, even thousands of years ago, the ancestors of the Celts must have been aware of, as is shown oy the mighty sacrificial altar stones in the middle of the moor. Suddenly, a loud static noise, hissing and rustling, tore Sgt. Dodd out of his reverie. They were just then driving into a curve when, to the right, a bright white light seemed to be diving towards them in a glide. They thought it was a burning airplane so they drove to the side and stopped the car to see what was happening and where it would land, in case help was required. It was, however, no airplane but a big shining disc which flew over their heads at a speed of about 40 mph. At its closest, it was hardly 100 feet away from them, so that they could see a number of details. When I interviewed Dodd in 1991 for my documentary film UFOs: The Secret Evidence, he explained, "It had a dome with ports all around it. The bottom was surrounded by colored lights like neon lights in blue, red, green and white which blinked in a sequence as if they were rotating, and in the middle there were three spheres or hemispheres. It was a huge thing, about 100 feet in diameter, and it made no noise whatsoever. What fascinated me even more was that the object was enveloped in a kind of halo which made its entire metallic structure glow white. It flew slowly over our heads and seemed to land at a place behind a group of trees. But we couldn 't see or check that out because at that point it was too far away and in the middle of the moor." "What on Earth was that?" asked Constable Dale breaking the silence, brought back to reality by the penetrating cold. Sgt. Dodd's answer came minutes after that. "I don't know, but it was wonderful. " 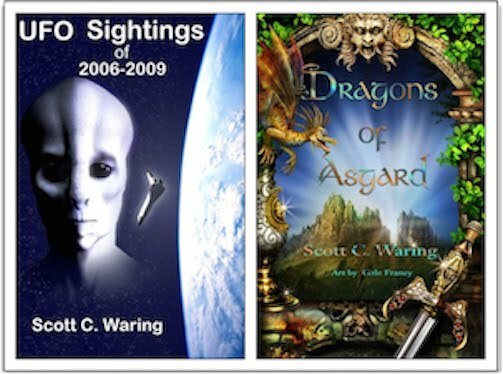 From that day onwards Dodd started collecting all the information about UFOs that he could get, including, of course, the book "Flying Saucers Have Landed" by Desmond Leslie and George Adamski. 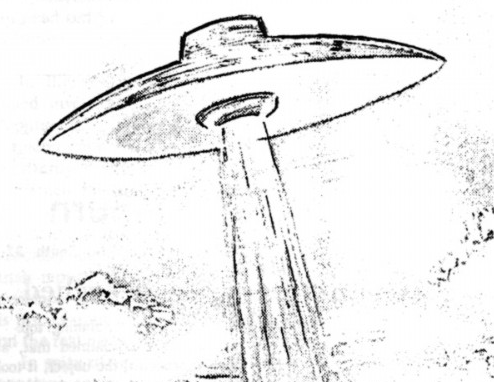 His personal encounter with a saucer that resembled Adamski's saucer like a twin had convinced Dodd that Adamski must indeed have had an encounter with a UFO. Since retiring in 1988, Dodd has dedicated himself fully to his "cosmic hobby" as he calls it, and is today one of Britain's leading UFO researchers. Adamski was the first person to have spoken about contact with aliens who resembled human beings. After him many others reported such encounters. With Adamski, the age of the contactees had begun. This is probably the most well known sighting in Newfoundland. I have copies of official documentation of this event. On November 26, 1978. A Mr.Chester Lethbridge and his wife, reported to the RCMP a strange object in the sky for the second time over the duration of approximately one week over Random Island, Trinity Bay, Newfoundland. This object was also being tracked by the Department of National Defense, Gander, NF. After observing the object with the naked eye for a while, Constable Blackwood took out this ball‑scope, a device used to amplify light sources in the night, to observe the object. This was definitely not a plane nor like any other aircraft Blackwood had ever seen. After observing the object in the sky for a little while longer, Constable Blackwood decided to turn on the flashing lights on his police car, Mr. Lethbridge, however, did not approve of this and went inside. Constable Blackwood flicked on the flashing blue and red lights on his car, and within seconds the object in the sky imitated the pattern of flashing lights. Constable Blackwood was speechless, being interested in different types of aircraft as a hobby, Blackwood confidently says that though the craft was about the size of DC9 aircraft, it was definitely not a plane; it did not resemble any type of plane ever built to his knowledge. It had no wings and made no noise; it had a curved tail and a cigar‑shaped body and that was all, besides the flashing lights. 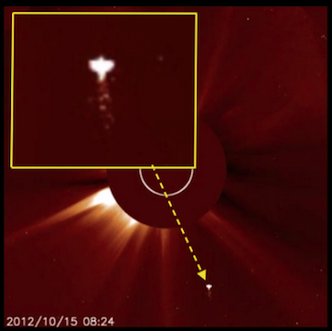 After a period of about two hours, the object "left the scene like a shooting star, only in the opposite direction." Shortly after this sighting in Clarenville, Newfoundland, Constable Blackwood, following procedure, made reports and sent them to the NRC ‑‑ National Research Council, in Ottawa. The National Research Council had an upper atmosphere research facility that, at that time, was responsible for UFO reports. An authority with the NRC by the name of A.G. MacNamara responded to these reports by saying: "The objects were most likely the planet Jupiter, which is quite brilliant. It appears about midnight in mid‑October and is near the Mediterranean Sea. Saturn and several other bright stars are also visible in the Eastern sky at this hour of the night". Constable Blackwood was quite disgruntled at these comments by Mr. MacNamara, and the fact that MacNamara was making these assumptions without even talking to him or any of the witnesses of the sighting. Blackwood assured me in a 1997 phone interview, that it was not the planet Jupiter nor was it Venus or any other star or planet, for he had seen these in the sky and was positive that this was not what he had witnessed hovering over Random Island for two hours. It must be kept in mind that the object seen by Chester Lethbridge, his wife and Constable Blackwood did cast a shadow on the water, and planets; stars and satellites do not cast shadows. Blackwood has retired from the RCMP and no longer lives in Newfoundland. 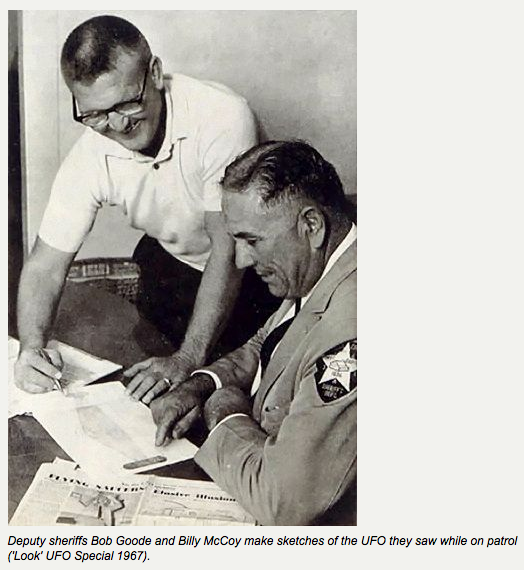 "UFO Spotting Focuses On Deputy Creel"
When Madison County Sheriff's Deputy Kenneth Creel left on a routine patrol drive last Thursday evening, he didn't expect to find his attention completely focused on an Unidentified Flying Object (UFO). Since he reported the incident to the Mississippi Highway Patrol that evening lastweekhowever, Creel has now found even more national attention focused on himself. "I know I'm not crazy .. I've always said I didn't believe in this stuff," said Creel. "I don't know what I saw, but I know I saw something . . It's just hard to describe what happened." Deputy Creel first saw the object while driving down the Smith School Road four miles west of Flora, near the county line. He was with Constable James Luke at the time. "It looked like an evening star or something," said Creel, "but it kept getting brighter and bigger." Then, when the shape of the object began to form, Creel said he contacted the Mississippi Highway Patrol with his car radio equipment. "I kind of thought it was an airplane flying low, or like it could have been." But when the strange object came within "about 200 yards" of his car—"out across the field"—then, Creel said, "I stopped and cut my engine and my lights to listen." What he heard was a whirring noise—"like a blender . . Like it was straining, when you first put ice in it"—and then the UFO started coming closer. "The thing came right over the car," said Creel. "It came right to us, like it was being piloted." How "the thing" got there is another question, because Creel says he could not tell if anything or anyone was inside. "The thing just hovered over us, about 20 or 30 feet up, for more than a minute," said Creel, who at this time was looking straight up, from his patrol car window. "I didn't get out, I wouldn't." According to Deputy Creel, there was little way to tell much about the craft. "There was light coming out from little windows," he said. And the light apparently changed colors several times, from soft blue to red to green and other colors. The UFO was reportedly about 30 to 40 feet in diameter, and perfectly round. "It didn't spin or anything. It just hoovered around there." After about a minute, Creel began backing up his patrol car "about 100 yards, to a place where I could turn around." 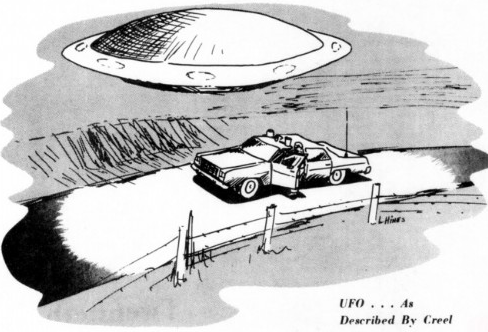 By this time, however, Highway Patrolman Louis Younger drove up in his patrol car within a short distance of the UFO, and reported seeing the same object—with the same description Creel had given. "Then the thing just picked up and took off, north west, toward Satartia." An unidentified object of the same general description was reported the same evening by other Flora residents, and Deputy Charles Bowering and Highway Patrolman Joe Chandler and others said they saw lights from an unidentified craft "from a distance." Since the sighting last week, Creel has tried to play down the incident. There have been no more reports, but dozens of inquiries have come to Creel and the Sheriff's Department for further investigation. Some are "real cranks," according to one department official. Others, apparently are more serious investigators. But as far as Creel is concerned, he would rather not have the attention. "If I had known how much trouble it was going to cause, I wouldn't have reported the thing in the first place," he said from the Sheriff's Office last Friday. And moments later the telephone rang. It was another radio station wanting to talk to Deputy Kenneth Creel. In spite of the fact that he apparently possesses numerous valuable talents, not the least of which is a gift for architectural design, a severe physical problem has forced twenty-seven year old Mike Foss of rural Milbank, South Dakota, to forego a promising career in favor of a less strenuous part-time job as a radio dispatcher for the local Milbank police department. Following a recent divorce, Mike has made his home with his parents, Mr. and Mrs. Norman Foss, who live on a farm several miles south and a bit west of the city itself. Although the farm house has apparently been in Mrs. Foss' family for ; cars, the Fosses themselves have on'y occupied the dwelling since June. Norman Foss is a retired nineteen-year veteran of the South Dakota Highway Patrol. At about 6:30 P.M. (CST) on the evening of November 27, 1976, Mike Foss left a local auto body shop in Milbank intending to return home by car. The weather was clear and crisp — temperature near zero. Travelling south on highway 77 out of Milbank, he suddenly noticed a "tremendously bright, brilliant orange light" - perhaps better described as "a light without a source" -off to the west (right) of him. Almost immediately ruling out the moon, he continued to watch the object for a few moments until turning to proceed westward toward his parents' farm on a gravelled county road. Now realizing that whatever was responsible for the light was hanging over a field alongside the road, Foss stopped for a better look. (Note that he did not leave the car, nor did he notice any peculiar effects on the car's electrical system or engine.) At first thinking that he might be witnessing a helicopter he was not immediately apprehensive about it: however, he soon realized that whatever it was he was observing, was clearly not any sort of helicopter he was familiar with. Now somewhat frightened, Foss "floored the foot feed" and headed for home about a mile and a half away as fast as possible. Believing he had left the object in the field behind him, he intended to pick up his parents and return to the spot to show them what he had seen. Accordingly, he began blowing his car's horn as soon as he approached the driveway, and, arriving at the house, jumped out of the car and ran into the house yelling to his mother and father to "come quick". They did. Returning back outside with his father, Mike realized that whatever he had left behind in that field was now perched a few feet in the air neatly between the hog house and the barn, about 100 feet from where they were standing(see diagram, figure A). 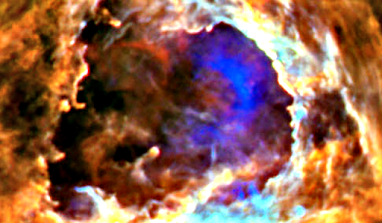 For the next twenty to twenty-five minutes, the three Fosses watched as a large, somewhat egg-shaped object, blue at its base, but flashing multi-colored lights (mostly red) higher up and having two protruding legs or antennae, as it first hovered between the hog house and the barn, and then drifted (or appeared to drift) slowly straight away from them and off to the southwest, diminishing in size and intensity until it finally disappeared in the distance. 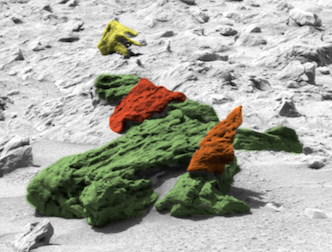 The changing colored lights on the body of the object were described as being somewhat like a color-wheel used to light up Christmas trees in different colors, except that the colors did not change rapidly, but seemed to "melt" into one another. Orange, white, blue, red, and green were noted. 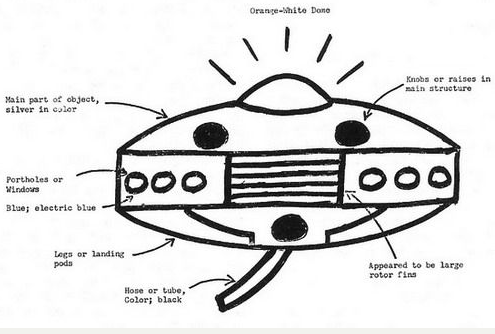 (Mike Foss' concept of the object appears in his drawing of it, labelled Figure B). The distance between the barn and the hog house on the Foss farm is about sixty feet. The barn is located almost due west of the house, and the hoghouse is situated somewhat to the southwest. 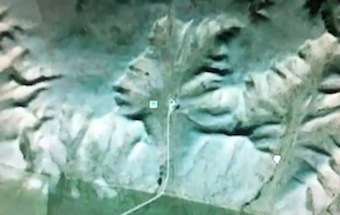 All three witnesses agreed that when the object was at its closest, it took up fully half the space between these two structures (perhaps 30 feet). Mike Foss' original estimate was that it was "about forty feet wide". Its height above the ground was described as "above the hog house (which is about 15 feet high), but lower than the peak of the barn, which is maybe 35 to 40 feet high". Just before Mike Foss arrived home from this encounter with the object in the field, Mr. Foss had been watching television in the living room. According to Mr. Foss, just prior to Mike's rushing into the house, the television began to "act up" by rolling vertically. He said that the set had a tendency to do this when a high wind blew the antenna wires around on the roof, and he remembers thinking that a wind must have suddenly come up. (The channel involved was channel 10.) After the object left the area, the television was normal again. Mr. Foss also states that, upon first going outside with Mike to watch the object, he could hear the sound of what he thought was traffic on the main highway about two miles east of the farm. He felt that "some heavy trucks must have been passing by". He also noticed a jet passing overhead going west, and says that he could clearly hear the aircraft and could see its wing lights. He noticed no other sounds. Also with regard to the yard being lit up, Mr. Foss recalls that his mercury vapor yard light, located near the barn (see diagram, Figure A.,) was definitely on. (Mike assumed that it was on, but did not notice. Mrs. Foss did not recall) In any event, this is interesting in that the light is operated by a photo-cell which turns it automatically on or off depending on the light conditions outside. Mrs. Foss, who did not venture outside, states that after a few moments the two men came in to get a pair of opera glasses (6x 1 5) to observe the object better. While they were looking for the glasses, she continued to watch the device from the kitchen window — which faces west and affords a good view of the area in question. She says that at this point the object began to drift away from its original position, moving away from the house at 180° toward the southwest. Then, appearing to have stopped once again, it began to emit, laterally, one at a time, what appeared to be "red balls" of some sort. These seemed to be without substance, were emitted from the sides of the object (but not at the same time) and travelled (or floated) about four of the parent object's diameters from the main body. One ball having reached this distance from the object, it ther "exploded" (noiselessly) into nothing; a which point another"ball" emitted from the opposite side of the device to repi the performance. By the time the men managed to find the opera glasses and return (a matter of perhaps two minutes?) this phenomenon had ceased and the object had begun to recede again slowly to the southwest. Although all witnesses agreed that the object had two protrusions or "legs" (Mr. Foss referred to them as "struts"), only Mike Foss noticed white lights on the tips of them. Mr. Foss clearly remembered the tips of the "struts" as being dark -- almost "as if the ends didn't quite touch one-another". About ten miles southwest of the Foss house is a low range of hills averaging about 1 000' higher than the flat plain on which the area surrounding Milbank is situated. This range of hills is visible in the distance when looking south or southwest of the house. It is significant to note that all three witnesses observed that before the object's final disappearance in the distance, it was below this line of hills, and intermingled with some farm lights which can be seen off in the distance. Mike Foss related that he was not particularly afraid of the object after his initial encounter with it, because, he said, he felt that "anyone who could produce a thing like that could have harmed (him) easily the first time, if it had hostile intent". He also stated that since this first sighting, he had experienced a strange recurrent dream in which he is alone on a hilltop "on a strange planet with a purple sky" watching a number of strange 'craft' maneuvering in the distance. "Some are silver and some are black, and there seems to be a war going on". In addition, he said he clearly felt that the object would return (it did — three times. See following.) and that it will return again. He was unable to explain why he felt that way. Immediately after losing sight of the object, Mike suggested to his father that they both take a piece of paper and go into separate rooms to sketch what they had seen while it was still fresh in their memory. When they got together again to compare the sketches, they were strikingly similar. True to Mike's prediction, the strange object returned again on three separate occasions between the initial sighting on November 27, and its most recent appearance at about 8:00 P.M. Saturday evening, December 11th. On two of these occasions, it was sighted only at extreme distances as a bright orange light maneuvering off to the southwest of the house. Because of this distance factor, no positive identification could be made. On the third occasion, the sighting was strikingly similar to the first. Again the object positioned itself between the barn and the hog house, again the weather was clear and cold, and as before, it remained in the area twenty to twenty-five minutes following the same pattern of slowly receding to the southwest. On this occasion, Mike's automatic police radio band scanner was on in the living room. At the appearance of the object, Mike noticed that the scanner had locked on to frequency seven and was emitting bursts of static. Frequency seven is a VHF frequency (approx. 140 MHz) used by the Minnesota Highway Patrol. This time, Mike Foss called Milbank police and asked that a car be dispatched. Police Chief Ben Amsden personally came out but by the time he arrived, the object was only a bright light in the distance. (Amsden, however, did notice an orange glow in the vicinity of the Foss farm while proceeding toward it in the squad car.) Also reported to have seen the object, this time in the area of theKMSD radio tower about two and one half miles from the Foss house, are Mr. Don Adams, bartender at the local VFW club, and his wife. 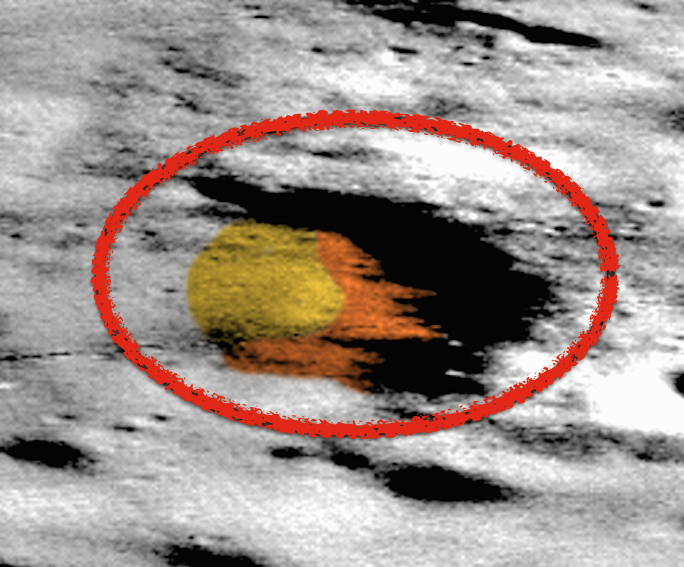 Because of the fact that all sightings were on a clear evening and all were in a westerly direction, this investigator continued throughout the interview with the Fosses (Dec. 22) to nurture the possibility that this case might have its origins in a highly exaggerated sighting of the planet Venus, which is quite prominent in the southwest sky at this time. Having concluded the bulk of the interview, I suggested we go outside to view the area and to check for any abnormal radiation with a Geiger counter which I had brought along. Immediately upon passing through the door of the Foss home (which faces directly south), 1 sighted Venus hanging prominently in the southwest. "Look", I said, "Is that the object you saw!?". "No", replied Mike, "we've been watching that too, but it's a satellite, or a star, or something. That's not what we saw." A similar question to Mr. and Mrs. Foss upon our return indoois (they had remained inside) produced a similar answer. Mr. Foss explained he was familiar with Venus from having seen it so often while on the road with the Highway Patrol. My check for abnormal radiation produced no exceptional results. Only three other items in this case seem to be worthy of mention. The first is that on Sunday, December 12, 1976, one day after the last sighting of the object (and the second close approach by it), the Foss' seven year old AKC registered german shepherd became ill. (Mr. Foss had obtained the animal in May of 1973.) On the 13th, the dog was examined by a Dr. Dotney, DVM, from Milbank, who diagnosed the problem as an apparent stroke (the animal's veins had collapsed and the dog was in shock) and recommended that the dog be put to sleep. This was done, and the animal was buried where the old outhouse had stood. (The burial site was also checked for abnormal radiation, but again the results were negative.) The Fosses did not consider that there might be any connection between the appearance of the object and the death of the dog. It is also significant to note that the animal had once undergone an operation for tumors of some sort. Perhaps more interesting is the question of the silo. Just as I was leaving the Foss home, Mr. Foss wondered out loud if his silo couldn't have had something to do with the repeated return (and apparent curiousity) of the object. Upon pursuing this, 1 discovered that completely housed within the Foss' barn is a twenty-foot diameter, thirty foot high all steel silo made of heavy pieces of boiler plate riveted together. He described it as looking like a "missile silo", and speculated that if the object they had seen was intelligently controlled (he thought it was) and possessed any sort of metal detection devices, it might have been understandably curious about what sort of structure was housed in that barn. Silos housed completely within barns are rare. All steel ones are almost unique! The final item is that upon arriving home and going through my file, I discovered a copy of an old picture I had once obtained from NICAP. Shown in the photo (reportedly taken from aboard the USS Ramsey off the coast of California in 1957) is an object which is strikingly similar to the one described by the Foss. The report we are about to examine has been exhaustively investigated by several individuals including Robert Pratt, who did exceptionally thorough interviews with all individuals important to the case, and Mr. Jack Bostrak, a Professor of Biology at the University of Wisconsin at River Falls. 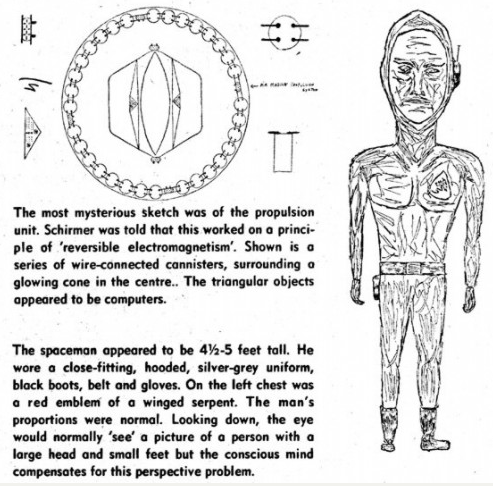 (1) The primary witness reported a UFO in April 1975, thus making him a "repeater". (Some researchers, and Dr. J. Allen Hynek in particular, have reservations concerning the believability of witnesses where they claim more than one sighting. It is our contention that during heightened UFO activity in a particular area, an individual could easily have more than one sighting.) (2) The object, or the glow from it, was seen by at least two other witnesses. (3) There apparently were electro-mechanical effects on an automobile and possibly on television reception, and (4) possible animal reaction. At about 11 p.m. on April 22, 1976, George Wheeler, a relief policeman at the town of Elmwood, population 737, located in west central Wisconsin about 60 miles east of the Mississippi River, spotted an orange glow at the top of Tuttle Hill. Mr. Wheeler is a veteran of 30 years police work in New York state and Wisconsin, and the former one-man police force in Eimwood where he now performs as reserve officer, filling in for the present chief when necessary. He was also a combat pilot in World War II. Thinking that the glow was a large fire, he drove to the top of Tuttle Hill, but when he arrived there he found a strange glowing object which he estimated was about 500 feet distant and hovering about 100 feet off the ground. He said it was between a limestone quarry and a farmhouse in the area. Wheeler later said that there were six bluish-white lights, windows or portholes on the side and he could see shadows as if someone was moving inside of it. In the middle of the side facing him there appeared to be some kind of a panel that was open and Wheeler said that inside he could see something which was revolving slowly and had fin-like parts on it similar to a turbine. 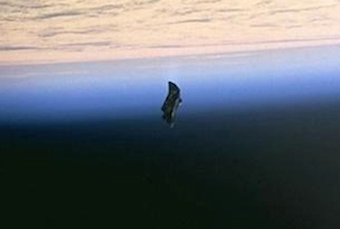 What Wheeler interpreted to be legs on the craft were partially extended from the main body of the object and there was a long, black, hose-like appendage on the bottom. The main part of the craft was silver in color. All the while he was observing, Mr. Wheeler remembered some advice given him by Bostrak the preceding April when he had his first experience: if he should have a similar experience in the future, he should attempt to observe as many details as possible. When Wheeler first saw the object as he arrived at the top of the hill he radioed the sheriff's department headquarters in Ellsworth and described what he was observing. Suddenly the object started to rise straight up at extremely high speed and at this time there was a bluish flash, whereupon the squad car, the lights, and the radio went dead. Wheeler claims that he doesn't remember any more until somebody asked him if he needed any help. He thinks he recalls saying something of this nature when he radioed the sheriffs office: "My God, it's another one of these UFOs or spacecraft." He estimates that he observed the object for perhaps 45 seconds, and recalls that it made a "whooshing" sound when it left. Although the main body of the craft was silvery in color, the top of it glowed an orangish-white, and so brilliant that it was difficult for him to look at that part because it was "like looking into the sun." He could not discern whether the hose-like appendage was touching the ground because it extended down to where it was obscured by trees. The limestone quarry where the object was hovering is an active quarry, that is, it is still being worked. In the neighborhood, the nearest farm is that of the O'Bryan family and when Bostrak interviewed Mr. O'Bryan he said that he hadn't seen anything because he was watching television, and casually noted that he recalled the time because he was watching the Perry Mason show which comes on at 11 p.m. and that several minutes after 11, his television set quit for a short time. When Bostrak visited another farm with Wheeler they learned nothing from the adults, but the 9-year-old boy said something about his sister coming home from "some doings" in town and when she came into the yard the dogs did not act normally. Always before, the dogs would run up to her and jump up for attention and petting but on that night they would not respond to her calls and merely barked for some time. The first person to see George Wheeler after the accident was David Moots, 36, a dairy farmer at Elmwood. Moots had taken the babysitter home a few minutes before that and he had seen Wheeler's squad car parked elsewhere with lights on, etc., so when he saw the car parked on the top of the hill with the lights out and blocking that lane of the road, he decided to stop. Moots said that Wheeler was trying to get out of the car and there seemed to be something wrong with him. Knowing that Wheeler had once had a heart attack, he thought he might be having another so he stopped and asked what was wrong. Moots said that Wheeler said that he'd been hit. He responded with a question: "Hit by a car?7' Wheeler then said, "No, one of those UFOs." When interviewed, Moots said that he'd heard that a iot of people had seen UFOs in the area before so that was no particular surprise but the being "hit" by a UFO took him aback a bit. He said that Wheeler appeared to be daz.ed, and because although he did not know him well, he had had sufficient contact with him to know that he was not acting normally. A second witness to the incident is Mrs. Miles Wergland, a housewife who lives just outside of Elmwood to the North. She claimed that at about 11 o'clock she heard the cuckoo clock strike and got up to go to the kitchen to take some medicine when she happened to glance out the kitchen window and spotted a "bright orange moon-shaped" object on the hill (Tuttle). She said she observed it for a "few minutes", then went back to bed and did not even bother to wake her husband because she said she had seen strange things in the area before and he had merely told her to go back to bed, she was seeing the moon, without ever checking for himself. The third witness to the actual object is Paul Fredrickson, who is administrator of the Heritage of Elmwood Nursing Home in Elmwood. Mr. Fredrickson was at his home when the police chief's wife called him and asked him to go to his front porch and look out the window and see what he could see. Fredrickson did as he was asked, and saw what he later described as "an orange glow, like a half-moon, like a moon cut in half" on Tuttle Hill. He said he knew it was not a house on fire as there were no flames leaping up. He went back to the telephone and by that time his wife had gotten out of bed and the two of them went back to the window and the thing was gone. Fredrickson feels that the length of time that he spent on the telephone might have been from 3 to 5 minutes. In the course of the investigation, Mr. Pratt found that Mr. Fredrickson had had another experience along with his son in October, 1975, at which time they were in the same general vicinity, and driving home from the Nursing Home where Mr. Fredrickson had worked overtime. His son suddenly pointed out "something" coming up over the horizon. At the time, they were on Tuttle Hill and looking eastward "right over the top of our house". Fredrickson said his first impression was that it was the full moon rising but then realized it couldn't be because the object was'rising very rapidly. He stopped the car and they got out, the boy getting a better look because Mr. Fredrickson was busy with braking, turning off on to the side of the road, etc. Mr. Fredrickson described it at first as a big orange light coming toward them, but when it was overhead it looked like the bottom of a huge, gray plate which he estimated was about 100 feet across. He thinks perhaps it may have been between 500 and 1,000 feet in altitude and when it was directly overhead they could hear a roaring sound much like the roar of a waterfall. The Fredrickson boy said that the object gave off a blue and green beam from the side of it at one point, but this was while his father was engaged in stopping the car. The object faded into the distance rather quickly, they said; having originally come from the east, it disappeared into the west. Fredrickson did not make careful note of the date at the time, but feels it was around the 20th of October and that the experience took place between 10 and 10:30 p.m. The next individual to become involved in the Wheeler incident was Police Chief Gene Helmer of Elmwood. He had been at home and monitoring the "police scanner" when he heard Wheeler say that he was watching a UFO. Helmer said Wheeler had started to describe the object but the radio went dead. The Sheriffs Department was trying to contact Wheeler by radio also, and Helmer tried to get Wheeler back, but to no avail. Helmer decided he had better go and see what was wrong when Wheeler came back on the radio momentarily and said, "Get somebody up here — I've been hit." Helmer, who lives about a quarter of a mile from Tuttle Hill, left immediately and when he arrived at the scene, Moots was trying to soothe Mr. Wheeler. Helmer said that he had never seen a man as frightened as Wheeler was. He said further that he had worked with Wheeler under various trying conditions but had never seen him so upset. Another interesting aspect of Chief Helmer's interview was his description of the condition of the patrol car. Although they had had the car tuned up not long before the incident, it was necessary to replace all points and plugs in the car's engine. The starter is beginning to act up also, whereas they had had no problem with it prior to the incident. Wheeler's wife arrived on the scene at about the time the Police Chief got there, as she had been listening to the police frequency on the Wheeler scanner. Wheeler was taken home and the family doctor, Frank Springer, was called. Mrs. Wheeler took her husband to Springer's home where he examined Wheeler and gave him a shot to calm him and help him sleep. After they got home, Chief Helmer arrived and questioned Wheeler for about an hour and a half. At about 1 a.m. Mrs. Wheeler called Dr. Springer and said that her husband was still quite upset and Dr. Springer instructed her to take her husband to the hospital. Wheeler was in the hospital for three days where tests were taken but nothing could be found wrong with him. He stayed for three days, was released, but went back to the hospital for a second stay of 11 days because of headaches he was suffering, as well as nightmares. Dr. Springer, who has been Wheeler's physician for 25 years, said that it was unusual for Wheeler to suffer headaches and the headaches he had which prompted him (the Dr.) to re-hospitalize him were continual and severe. Otherwise, however, Wheeler was rational and appeared normal. One puzzling aspect of this case is the fact that although Wheeler recounted the entire experience to Helmer, who recorded it in writing, he could not recall any of the details of the experience later. Full Description of event/sighting: I was a truck driver on a trip from NYC to Albany. The fastest way was to take the thruway upstate. As I was driving I noticed that I really couldn't get much on the CB and the AM radio was more static than anything else. Sometime around 8:30 or so I started to notice that there were occasional cars pulled off to the side of the road and even some in the median. As I pulled under an overpass I saw this thing floating over the road about 100 feet above the roadbed. I slammed on the brakes and almost jackknifed right there! It was approximately the size of a high school football field, but not quite as wide. It had lights on each end and in the middle with blue square lights all across the back end of the wings. I managed to get out of the cab of the truck and was standing in front of my truck looking up at it when a NY State Trooper pulled up and got out of his cruiser. He and I stood there for maybe two or three minutes just looking up. We noticed that there was absolutely no sound at all and that it didn't fluctuate or "flutter" and that it just floated in the air. We saw structure, that is we saw the body of the vehicle. No rivets or seams, just the silver/grey color of the body. The trooper called out to me and asked if I was seeing the same thing he was and I assured him that I was indeed seeing the same thing. Then suddenly it moved over the Hudson River, made a slight turn kind of facing up, and then the next second - literally one second - it was gone. That's it. Total time was about 5 minutes, no more. The CB radio came back and so did the AM radio. From there all the way up to Albany I tried to make people believe that I saw what I saw. No one believed me then and I don't think anyone believes me now. Still, I saw it. I'll never forget it. From time to time I have a dream that I'm seeing it again. But only in a dream. Q. - Can you please describe the weather conditions at the time of the sighting. Was it Overcast? Raining? A clear night? Full moon? A. 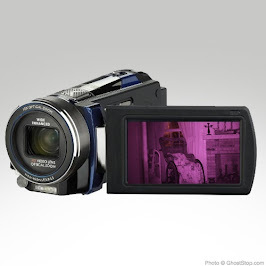 - "From what I can remember, it was fairly clear. I don't remember the moon at all, but I think that it was in the sky." Q. - In what part of the sky was the UFO located? North, South, East, West? On the horizon or straight overhead or somewhere in between? A. - "I was headed north and it was just above me. The trooper and I stood right underneath the thing." Q. - Can you please describe the area in which you made the sighting. Is it near an airport? An Air Force Base? A military or research installation of any kind? A. - "There weren't any airports around. I don't think I saw any air traffic at all before I saw it." Q. - The lights that were located on the ends, could you tell me what color these were please ? A. - "The lights on the ends were blueish/white and were steady in brightness. They were kind of like the new halogen lights on some of the newer cars." Q. - Also what color was the light that was in the middle of the craft ? A. - "Almost the same color as the ones on the end, but brighter." Q. - Seeing the craft so was so low to the ground, did you feel anything unusual from it. Dizziness or a feeling of being light headed ? Or anything else that you found out of the norm ? A. - "This going to sound a little weird, but we (the trooper and I) both felt light on our feet." Q. - At the time of the sighting, or just afterwards, did you happen to notice any aircraft showing up in the skies ? if so did they follow the same flight path that the object took ? A. - "I only saw one airplane about 5 or 10 minutes later. It was a small, single-engine Cessna or Piper. I don't think it sat more than 4 people, it was that small." Q. - Was there any other kind of light source coming from the craft ? A. - "No, I didn't see any portholes or windows on it." Thank you very much to the witness for the report. On August 13, 1970, Danish senior police officer Evald Maarup was driving back to his home in Knud, using the patrol vehicle at about 10:30 P.M., on a country road connecting Kabdrup and Flestrup, not far from the border enters Denmark and Germany, when something out of the ordinary happened to him. At about ten kilometers in the North of the town of Hadersley, the car became bathed in a very powerful bluish light, and the car engine stopped suddenly. The officer tried to communicate with his police station by means of the car's radio, but it did not function at all. It was if if all the electricity had disappeared of the patrol car. Officer Maarup then realized that the temperature inside the vehicle had increased, and that it continued to increase quickly. In his report, he stated that he had the feeling that one would have during a hot summer sun when it hits a car's windshield. A short moment later, it was obvious to him that the bluish light seemed to be withdrawing. Maarup realized that the light actually surrounded a flying machine of elliptical shape, metallic appearance, and of a diameter of approximately 10 meters, which was now rising in the sky. Maarup noticed that actually, the rise of the craft was not the only cause of the withdrawal of the light which surrounded it. He realized that the extent of the light around the craft decreased as if the craft was swallowing the light into its body, from a defined point located at the center of the bottom side of the craft, in which the light was engulfed as if it had been sucked into there. This part of the craft appeared clearly delimited to him, by a dark part of a diameter he estimated at one meter. 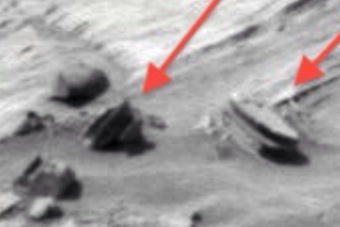 He also saw some protrusion on the underside of the objects (see drawing on the right). At this time, he remembered that he had a Fujaxa camera at disposal, as he is the rule, in the police car. 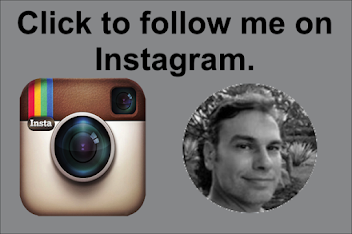 He used it, and managed to take three snapshots of the object. Those, developed the following day, did not show much more than a gleam of light, without revealing any details. After the series of events which Maarup estimated the duration of about five minutes, the craft then flew away at high speed in the sky. During all the events, the craft was totally noiseless. As soon as the object flew away, the car's engine started again spontaneously, the power went back, so that the lights went back, and the radio functioned again. Maarup then went out of the patrol car, to look for clues or evidence of the event in the surroundings. He found none, but when he touched the car, he noticed that it had become heated. 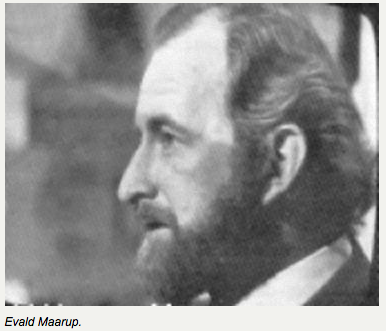 Very remarkably, Maarup had a second sighting almost three years to the day after this first encounter. 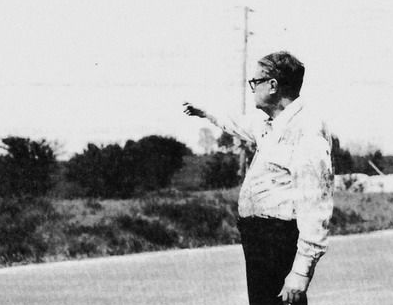 On July 14, 1973, in the same area and at roughly the same time, he saw a similar shaped UFO above the countryside as it passed over the landscape. Once again he was able to take pictures of the object but once again, all the six pictures were disappointing, showing only an indistinct spot of light. 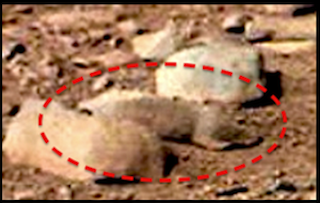 He also saw several dome like protrusions on the underside of the object. 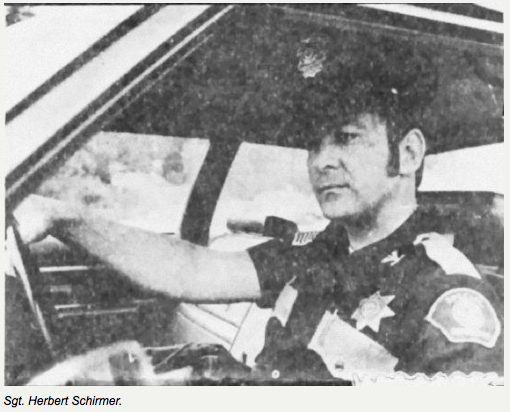 On December 3, 1967, around 2:30 a.m., in the vicinity of Ashland, Nebraska, police sergeant Herbert Schirmer, 22, noticed some red lights along Highway 63. Thinking that it was a stopped truck he approached and shown his high beams on it. Soon he realized it was no truck. Instead it was a disc-shaped object with a shiny, polished aluminum looking surface, and a catwalk that went around it. The red lights, which were blinking, were shining out from windows in the object. 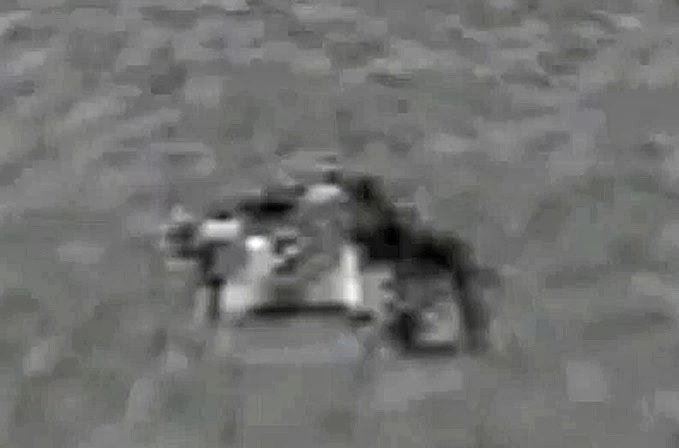 The UFO appeared to be a mere 6 to 8 feet above the road, and was hovering in the air with a slight tilt. Then the object began to slowly ascend, making a siren kind of noise, and issuing a flame-like display from the underside. Sticking his head out the window, Sgt. 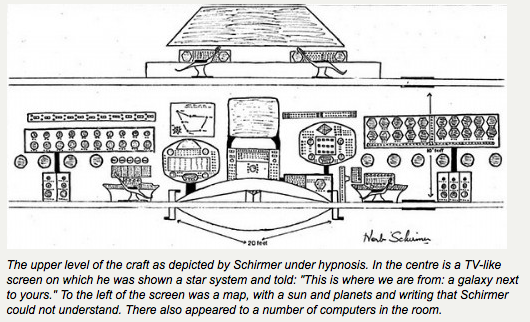 Schirmer watched the UFO pass nearly overhead. Then suddenly it shot up and out of sight. Schirmer then got out of the police car and, with a flashlight in hand, inspected the surface of the road where the object had hovered so low to the ground. After this he drove to the police station and wrote in the log book, “Saw a flying saucer at the junction of highways 6 and 63. Believe it or not!” He was puzzled to notice that it was now 3 a.m., as the sighting seemingly lasted no more than ten minutes. As the morning wore on, Schirmer was to suffer a headache, a “weird buzzing” in his head, and would discover that he had a “red welt” on his neck. It was about two inches long and approx. 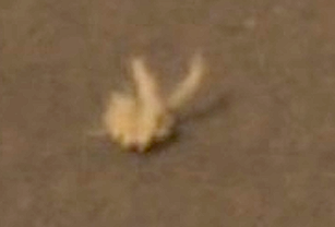 half an inch wide, and was located on the “nerve cord” below one of his ears. 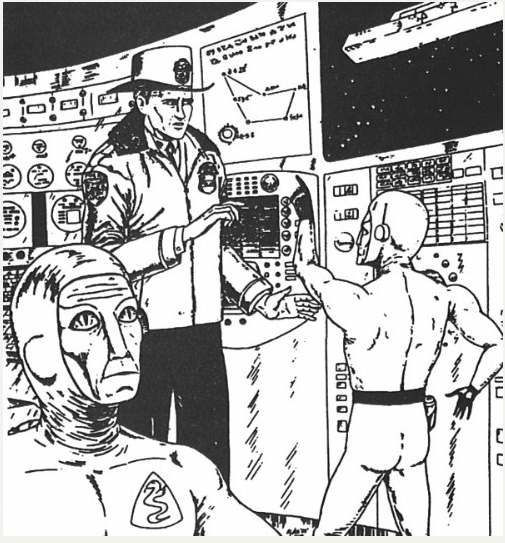 Later, under hypnosis, Schirmer would recall for investigators how humanoid beings, between 4 1/2 to 5 feet tall, escorted him from his car and into the ship, where the “leader” gave him a tour and explained various things about themselves and their mission on earth. The entities had slightly slanted “catlike” eyes (that didn’t blink), gray-white skin, long and thin heads, with flat noses and slitlike mouths. They wore silver-gray uniforms, gloves, and helmets (which had a small antenna on the left side around their ear), and at the left breast of each suit they had the emblem of a winged serpent. Schirmer had the impression that the small antennas were somehow a part of their communication process with him - that part of their contact with him was mental and part of it was physical. What did Brad make of this? “Either it’s a case of extreme identification or some sign of hypnotic contact that we seem to uncover as we probe deeper and deeper into the unconscious,” he replied. If he hadn't seen it with his own eyes, Henrico County Sheriff A.D. "Toby" Mathews said, he might not have believed it. On a bright moonlit night 33 years ago this summer, Mathews said, he saw a large unidentified flying object hovering silently near his Varina farm. He suspects whatever was inside the mysterious craft was responsible for snatching and snuffing the life out of his dog. "I really saw the thing, I really did," Mathews, 65, said this week when asked to respond to talk of his close encounter. "And I've never seen anything like that since then." Mathews said he never publicly disclosed what he saw until now because he felt no one would believe him. He talked about his UFO experience this week after The Times-Dispatch learned that he had told the story three years ago to his former chief deputy during a Christmas dinner in Williamsburg. Mathews, who's fond of sharing personal stories about his life, was candid about his UFO experience, which he noted occurred during a time when such sightings were reported with some regularity by Richmond-area residents. Goochland County, according to news accounts in The Times-Dispatch and The Richmond News Leader. 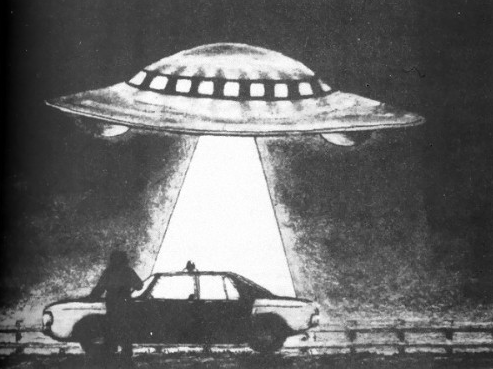 One Richmond patrolman told The News Leader that he chased the UFO in his patrol car. "If I live to be 100, I'll never forget it," said former Officer William L. Stevens Jr. in a July 21, 1966, news story. close. Mathews, a two-term sheriff, is running for the Varina District seat on the Henrico Board of Supervisors. With just four days left until the general election, Mathews this week recounted his UFO experience with little hesitation. He said it occurred Aug. 9, 1966, after he returnedhome from a psychology class at the former Richmond Professional Institute (now Virginia Commonwealth University). He was a road sergeant with Henrico police and was living alone at the time at his farm on Charles City Road in the county's Glendale area. At about 10:30 that evening, Mathews said, his German shepherd, tied to a chain out back, began barking loudly, so he went outside to investigate. After turning him loose, Mathews said the dog, which he had acquired only three weeks earlier, ran to the edge of an adjacent cornfield. He was astonished at what he saw next. "I happened to look up and there was that UFO right above the cornfield, it was just hovering right up above the power lines" about 200 feet in the air, Mathews said. The craft, which Mathews described as white and about 30 feet in diameter, made hardly a sound and emitted no light. The object was about 4 or 5 feet wide at its widest point, which was in the middle, he said. "It was just like the ones you see on TV," Mathews said. "It was a bright moon that night," so he got a good look at it. Mathews said he ran back inside his house to get a flashlight, and when he returned and shined it on the craft, the UFO turned slightly, emitted a burst of light and "took off like a bullet, just tremendously fast." Mathews said he rechained the dog and went to bed after the craft disappeared, and he got up about 5 the next morning and went out to check on his dog. He let it run loose for a few minutes, as was his routine, but the dog didn't come back. Mathews said he canvassed the area, but the dog was nowhere to be found. When he returned home, he was startled to find his dog lying motionless in the middle of the road just beyond his circular driveway. He was dead. "He didn't have a mark on him -- no blood, no singe [marks], no nothing," Mathews recalled. "It looked like he almost was sleeping. And whatever killed him, they had taken his chain collar off" and dropped it on the shoulder of the road. "I couldn't believe how it got off him like it did." Mathews said his neighborhood in those days was remote and largely devoid of traffic at that hour. "I didn't see any cars come through at the time." Mathews said he assumed that his dog was killed by whoever, or whatever, was in the UFO. "The dog let me know that they were there," he said. The dog's death remained a mystery, Mathews said. He buried the shepherd that morning in a meadow on his property. Mathews said the city officer who saw a saucerlike object near the State Fairgrounds a month earlier had urged him to notify the news media about his encounter, but Mathews resisted. Mathews was living alone at the time, and there were no other witnesses, he said. "I wasn't frightened by it; it was kind of awesome," Mathews said of the object. "Of course, back in those days I was still in the military reserve, and it didn't appear to be any type of military craft at all. Because No. 1, it wouldn't have done what it did" had it been a known military aircraft. In December 1996, Mathews told his story to then-Chief Deputy Patrick Haley and his wife, Brenda, during a Christmas dinner party at the Seafarers Restaurant in Williamsburg. "The way he told it was so specific and he was dead serious, he wasn't joking," said Haley, who now is deputy coordinator of law enforcement accreditation for the Virginia Department of Criminal Justice Services. "We talked about this for months." Haley, who resigned abruptly after about a year as the department's No. 2 officer because he believed incompetent leadership and dishonorable management practices by Mathews created a host of problems with the sheriff's office, recalled Mathews telling him a slightly different story about the encounter. Haley said he remembered Mathews saying the craft had landed and emitted some kind of strong "pull" that drew him toward it, although he managed to resist it. Haley also recalled Mathews saying that his dog, after it was found dead, appeared to have been burnt or singed. Mathews, however, said those things didn't happen. And he shrugged off how his strange encounter may be viewed by the public. "Well, I did see it," he said. "I really don't know what it was." 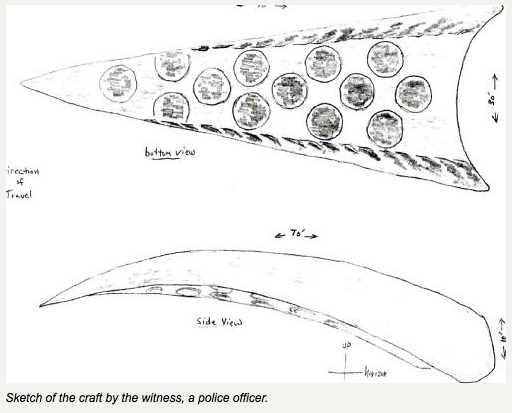 One of the most dramatic encounters by police officers with an apparently structured, low-level UFO occurred in the early morning of April 17, 1966. Officers of the Portage County, Ohio, Sheriff's Department first saw the object rise up from near ground level, bathing them in light, near Ravenna, Ohio, about 5:00 A.M. Ordered by the sergeant to pursue the object, they chased it for eighty-five miles across the border into Pennsylvania, as it seemed to play a cat-and-mouse game with them. Along the route, police officers from other jurisdictions saw the object and joined in the chase. “I always look behind me so no one can come up behind me. And when I looked in this wooded area behind us, I saw this thing. At this time it was coming up . . . to about tree top level. I'd say about one hundred feet. it started moving toward us.... As it came over the trees, I looked at Barney and he was still watching the car . . and he didn't say nothing and the thing kept getting brighter and the area started to get light. .. . I told him to look over his shoulder, and he did. "He just stood there with his mouth open for a minute, as bright as it was, and he looked down. And I started looking down and I looked at my hands and my clothes weren't burning or anything, when it stopped right over on top of us. The only thing, the only sound in the whole area was a hum . . . like a transformer being loaded or an overloaded transformer when it changes. . . .
"I was petrified, and, uh, so I moved my right foot, and everything seemed to work all right. And evidently he made the same decision I did, to get something between me and it, or us and it, or whatever you would say. So we both went for the car, we got in the car and we sat there...."
As they watched, the UFO moved toward the east, and then stopped again. Spaur picked up the microphone and reported to the dispatcher. At this time, the object was about 250 feet away, brilliantly lighting up the area ("It was very bright; it'd make your eyes water," Spaur said.) Sergeant Schoenfelt, off duty at the station, told them to follow it and keep it under observation while they tried to get a photo unit to the scene. Spear and Neff turned south on Route 183, then back east on Route 224, which placed the object to their right, and out the left window. “At this time,” said Spaur. "it came straight south, just one motion, buddy, just a smooth glide . . ."and began moving east with them pacing it, just to their right at an estimated altitude of 300-500 feet, illuminating the ground beneath it. Once more the UFO darted to the north, now left of the car, and they sped up to over 100 mph to keep pace with it. Police Officer Wayne Huston of East Palestine, Ohio, situated near the Pennsylvania border, had been monitoring the radio broadcasts and was parked at an intersection he knew the Portage County officers would he passing soon. Shortly afterward he saw the UFO pass by with the sheriff's cruiser in hot pursuit. He swung out and joined the chase. At Conway, Pennsylvania, Spaur spotted another parked police car and stopped to enlist his aid, since their Cruiser was almost out of gas. The Pennsylvania officer called his dispatcher. According to Spaur, as the four officers stood and watched the UFO, which had stopped and was hovering, there was traffic on the radio about jets being scrambled to chase the UFO, and ". . . we could see these planes coming in.... When they started talking about fighter planes, it was just as if that thing head every word that was said; it went PSSSSSHHEW, straight up; and I mean when it went up, friend, it didn't play no games; it went straight up” (Transcript of taped interview with Dale Spaur). 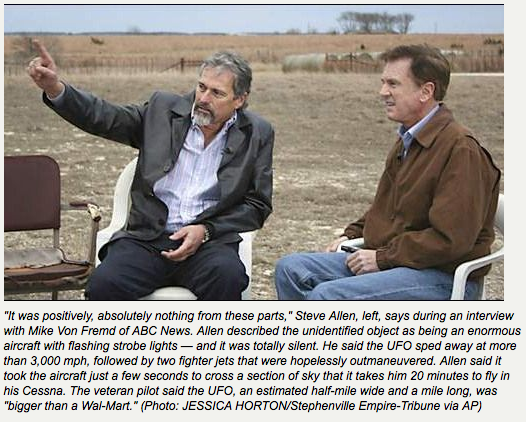 The Air Force "identified" the UFO as a satellite, seen part of the time, and confused with the planet Venus. 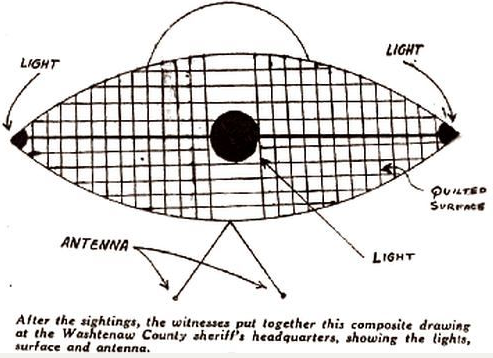 Under pressure from Ohio officials, Major Hector Quintanilla, chief of PROJECT BLUE BOOK, had an acrimonious confrontation with witnesses and refused to change the identification, although it was pointed out to him that they had seen the UFO in addition to Venus and the moon at the conclusion of the observation. Major Quintanilla also denied that any jets had been scrambled. William B. Weitzel conducted an exhaustive investigation on behalf of the NATIONAL INVESTIGATIONS COMMITTEE ON AERIAL PHENOMENA (NICAP), obtaining taped interviews, signed statements, sketches, and all pertinent data which was assembled into a massive report that was made available to congressional investigators. When the UNIVERSITY OF COLORADO UFO PROJECT was initiated in 1966, a copy of Weitzel’s report was hand-delivered to the director, Dr. Edward U. CONDON, for his consideration. The CONDON REPORT, published two years later, does not mention the case. "3:50 a.m. Received calls from Deputies Bushroe and Foster, car 19, stating that they saw some suspicious objects in the sky, disc, star-like colors, red and green, moving very fast, making sharp turns, having left to right movements, going in a Northwest direction. 4:04 a.m. Livingston County [sheriff's department] called and stated that they also saw the objects, and were sending car to the location. 4:05 a.m. Ypsilanti Police Dept. also called stated that the object was seen at the location of US-12 and I-94 [intersection of a U.S. and an Interstate highway]. 4:10. a.m. Monroe County [sheriff's department] called and stated that they also saw the objects. 4:20 a.m. Car 19 stated that they just saw four more in the same location moving at a high rate of speed. 4:30 a.m. Colonel Miller [county civil defense director] was called; he stated just to keep an eye on the objects that he did not know what to do, and also check with Willow Run Airport. 4:54 a.m. Car 19 called and stated that two more were spotted coming from the Southeast, over Monroe County. Also that they were side by side. 4:56 a.m. Monroe County [sheriff's department] stated that they just spotted the object, and also that they are having calls from citizens. Called Selfridge Air Base and they stated that they also had some objects [presumably on radar] over Lake Erie and were unable to get any ID from the objects. The Air Base called Detroit Operations and were to call this Dept. back as to the disposition. 5:30 a.m. Dep. Patterson and I [Cpl. Broderick] looked out of the office and saw a bright light that appeared to be over the Ypsilanti area. It looked like a star but was moving from North to East. 6:15 a.m. As of this time we have had no confirmation from the Air Base." Washtenaw County deputies B. Bushroe and J. Foster formally stated: "This is the strangest thing that [we] have ever witnessed. We would have not believed this story if we hadn't seen it with our own eyes. These objects could move at fantastic speeds, and make very sharp turns, dive and climb, and hover with great maneuverability. We have no idea what these objects were, or where they could have come from. At 4:20 a.m. there were four of these objects flying in a line formation, in a north westerly direction, at 5:30 these objects went out of view, and were not seen again." Deputy Bushroe told the press: "It would swing back and forth like a pendulum, then shoot upward at tremendous speed, hover and then come down just as fast." Dexter police and Livingston County sheriffs, contacted by Bushroe and Foster, "reported that they saw the same objects engaging in the same maneuvers." March 17, 1966, Milan, Michigan. 4:25 a.m. Sgt. Nuel Schneider and Deputy David Fitzpatrick saw top-shaped objects making sharp maneuvers. They alternately hovered, rose and fell quickly, darted around at jet-like speed, their light dimming and brightening periodically. In a report to NICAP, the officers stated that two objects were operating together, circling and flying in formation, while a third object hovered at lower altitude. March 20, 1966, Dexter, Michigan. 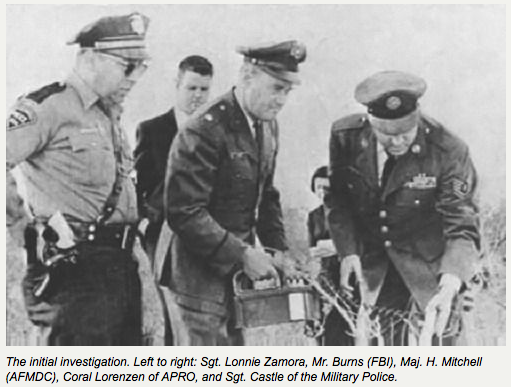 About 8:30 p.m. Frank Mannor and family, and dozens of other witnesses, reported that a domed oval object with "quilted" or "waffled" surface and lights in the center and on each end had landed in a swampy field. Deputies David Fitzpatrick and Stanley McFadden parked car #34 adjacent to the area and began a search with Frank Mannor. "While in the woods area," their report states, "a brilliant light was observed from the far edge of the woods, and upon [our] approaching, the light dimmed in brilliance....The brilliant light [then] again appeared, and then disappeared. A continued search of the area was conducted, through swamp and high grass, with negative results. Upon returning to the patrol vehicle, the undersigned officers were informed that one of the objects had been hovering directly over the area where our flashlight beams had been seen, and then [it] departed in a west direction of flight, at high rate of speed." As he and other officers were rushing to the scene, Officer Robert Hartwell of the Dexter Police Department saw a luminous object buzz his car. Robert Taylor, Dexter Police Chief, said he watched an object in the field from Frank Mannor's home on a knoll overlooking the area. It appeared as a pulsating red, glowing object. Through binoculars he saw "a light on each end of the thing." 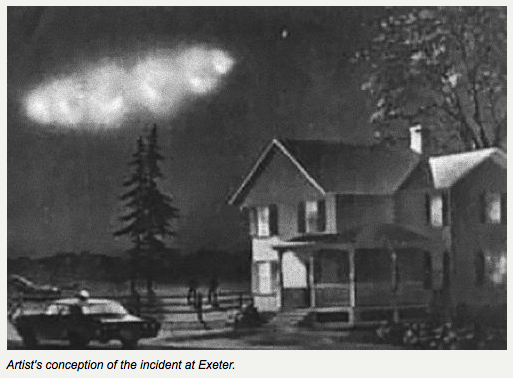 During an extensive wave of sightings in 1965, police officers in Exeter, N.H. and Damon, Texas both had close-range encounters with UFOs - structured objects with body lights - on September 3. (See separate report on Texas encounter). On the night of September 16 two Pretoria, S. Africa, constables came upon a disc-shaped object resting on the Pretoria-Bronkhorstspruit highway. The headlights of their police van illuminated the copper-colored object which appeared to be about 30 feet in diameter. On top of the UFO was a small dome. 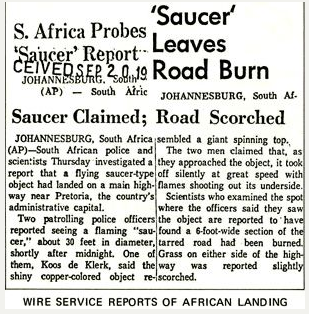 Constables John Lockem and Koos de Klerk had been patrolling the highway just after midnight when they suddenly drove up on the object. In seconds the UFO suddenly lifted off the road, emitting tongues of flame from two tubes or channels on the underside. "Its lift-off was quicker than anything I have ever seen," Constable Lockem reported later. 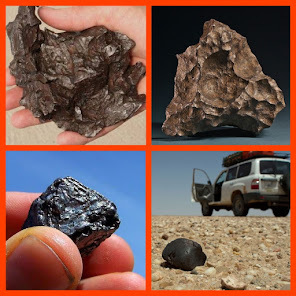 Flames from the macadam (tar and gravel) road surface shot up three feet in the air as the UFO departed, blazing long after it was out of sight. Later investigation showed that part of the road was caved in, evidently from a heavy weight, and gravel had been separated from the tar in a severely burned area about six feet in diameter. 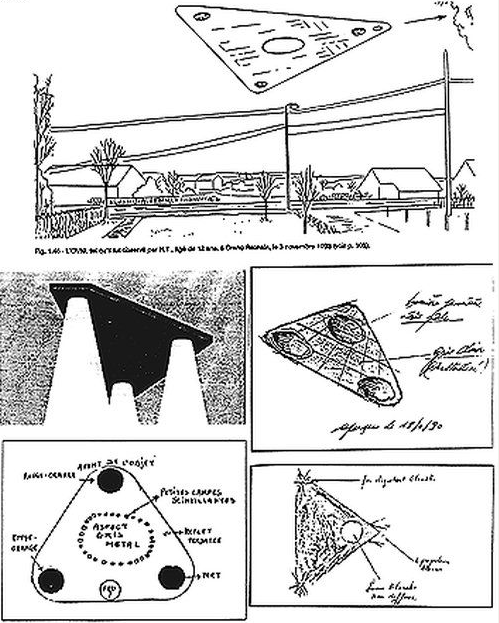 Constable Lockem drew a sketch of the UFO with the aid of a staff artist of the newspaper Die Vaterland. The District Commandant of Pretoria North, Lt. Col. J.B. Brits, told the newspaper that the event was considered "as being of a highly secret nature and an inquiry is being conducted in top circles." Samples of the damaged road surface were analyzed by a leading scientific agency in South Africa. NICAP has been unable to obtain copies of the analysis reports. About 11:00 p.m. on a Friday night, Deputy Sheriff Bob Goode, 50, was driving his patrol car south out of Damon toward West Columbia on Highway 36. Since he had suffered a bite on his left index finger earlier that day from a baby alligator, he had asked Chief Deputy Billy McCoy, 38, to ride with him in the event the pain flared up and interfered with his driving. It was a sparkling clear moonlit Texas night, and Goode rested his arm in the open window of the door as they drove through the prairie. Suddenly McCoy spotted a bright purple light on the horizon to the southwest which appeared to be about five to six miles distant. At first they thought it might be something in the nearby oil fields, perhaps an oil-drilling rig. But then a blue light, smaller in diameter than the purple light, emerged from it and moved to the right before stopping. Both lights remained in this orientation for a while before beginning to drift upward. This upward floating motion continued until the objects reached an elevation of 5-10 degrees above the horizon. 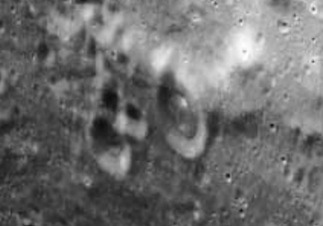 Goode then studied the lights through a pair of binoculars, but could not make out any additional features. As their curiosity mounted, the officers began to look for back roads that might take them closer to the lights. They stopped again, and this time the lights suddenly swooped toward them, covering the intervening distance in 1-2 seconds, abruptly stopping practically overhead. Their patrol car and the surrounding terrain were brightly illuminated in purple light. They could now see that the purple and blue lights were attached to opposite ends of an enormous object, hovering about 150 feet from them at about a 100-foot altitude. 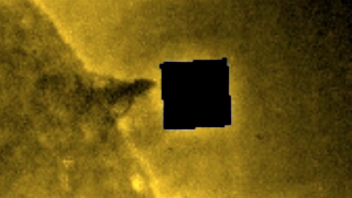 "The bulk of the object was plainly visible at this time and appeared to be triangular shaped with a bright purple light on the left end and the smaller, less bright, blue light on the right end. 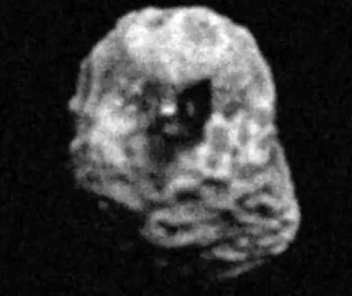 The bulk of the object appeared to be dark gray in color with no other distinguishing features. It appeared to be about 200 feet wide and 40-50 feet thick in the middle, tapering off toward both ends. There was no noise or any trail. The bright purple light illuminated the ground directly underneath it and the area in front of it, including the highway and the interior of our patrol car. The tall grass under the object did not appear to be disturbed. 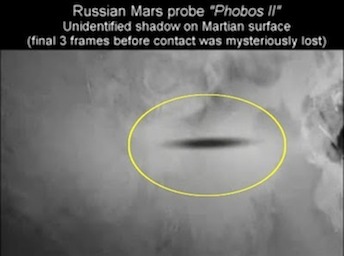 There was a bright moon out and it cast a shadow of the object on the ground immediately below it in the grass." To both men, the object seemed to be "as big as a football field." Goode could feel strong heat emanating from the object onto his left arm, through his shirt-sleeve. After a few seconds, with the strange object hovering almost directly overhead, they fled the scene and headed toward Damon "as fast as we could go," making speeds of up to 110 miles per hour. McCoy kept watching the object out the rear window of the car. 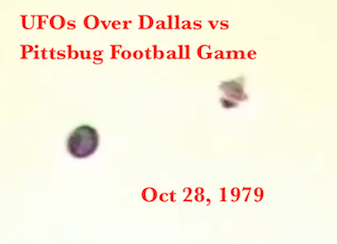 For 10 to 15 seconds, the UFO continued to hover above the pasture. Then it abruptly shot back in the direction from which it had come. "After arriving at approximately its original position," McCoy reported, "it went straight up in the air and disappeared at 25-30 degrees above the horizon." Back at Damon, the shaken officers calmed themselves, and then decided to go back and investigate again. This time they drove down the Damon-West Columbia road, but saw nothing. Finally they returned to the area where they had first seen the lights, and once again spied the purple light on the horizon, and again saw the smaller blue light emerge with a strange two-step motion and float upward. Fearing another close encounter, they again fled the area. Goode and McCoy continued on their shift until three or four in the morning, then stopped for breakfast at a cafe. Goode noted that his alligator bite was no longer sore, and when he unwrapped the bandage he discovered that the swelling had gone down and that the wound was nearly healed. Next day, the wound showed virtually no scarring. The deputies reported the sighting to Ellington Air Force Base, and Major Laurence Leach, Jr., arrived on September 8, 1965, to interview McCoy and Goode and take a statement. Leach's report to Project Blue Book headquarters at Wright-Patterson Air Force Base reflected his puzzlement. "There is no doubt in my mind," he said, "that they definitely saw some unusual object or phenomenon....Both officers appeared to be intelligent, mature, level-headed persons capable of sound judgment and reasoning." EXETER - Engulfed in the blackness of a late summer night, a teenage Navy recruit walked down the quiet country highway. Suddenly, a huge object loomed above him. Throwing himself to the ground to avoid being hit, he huddled against a stone wall. The blood drained from his face. The time was around 2 a.m. The date was Sept. 3, 1965. Thus began the "Incident at Exeter," a series of sightings officially qualified as a legitimate visit from an unidentified flying object. In September and October 1965, several sightings in New Hampshire were carefully investigated and documented by local and federal offices. 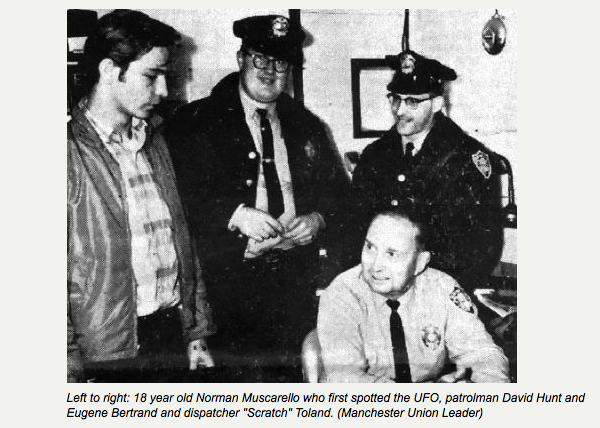 The encounters that night took special precedence over other UFO sightings because of the credibility of Exeter police officers Eugene Bertrand and David Hunt, as well as Reginald "Scratch" Toland, who was dispatcher and supervising officer when the shaken teenager, Norman Muscarello, came to the police station claiming he had encountered a UFO. A similar report substantiated his story. Earlier, Bertrand had come upon a lone woman parked on the side of Route 101 near an overpass two miles outside Exeter. She said a huge, silent, red and brilliantly glowing airborne object had chased her from the town of Epping about 12 miles away. It had been only a few feet from her car before it departed at a tremendous speed and disappeared. Bertrand saw nothing but a bright star and sent her home. Toland also spoke to the woman, who told him she had been chased by the "low-flying, large, round object with flashing red lights." An hour later, Bertrand received a call from Toland to report back to the station immediately because "a kid had come in who had seen a UFO." The police officer picked up Muscarello at the station. The teen led him back to the site where he'd seen the craft. After sitting in the parked cruiser for several minutes, Bertrand radioed the dispatcher to say they saw nothing unusual. Bertrand, instructed to check out the field before heading back, proceeded to do so with Muscarello. Horses in a nearby barn began to kick and whinny. Dogs in the neighborhood began to howl. Muscarello shouted, "Look out, here it comes!" and they watched as something luminous rose from behind tall evergreens. The aircraft, about 100 feet away, silently sped so close to Bertrand that he dropped to the ground and drew his service weapon. "There was this huge, dark object as big as that barn over there with red flashing lights on it," Bertrand later told an investigator. "It barely cleared that tree right there, and it was moving back and forth... It seemed to tilt and come right at us. Norman told me later that I was yelling, 'I'll shoot it! I'll shoot it!' I did drop on one knee and drew my service revolver, but I didn't shoot." Bertrand, dragged Muscarello, frozen with fear, back to the cruiser. From the car, the men saw no tail, no wings and heard no sound. Already en route, Hunt arrived within minutes and saw the UFO as it "floated, wobbled and did things that no plane could do" before it darted away toward Hampton. They returned to the station to write their report. Toland received a call shortly after from a Hampton telephone operator who said that a distressed motorist attempted to contact the police from a pay phone. He yelled at the operator, saying he was being chased by a flying saucer that came right at him and that it was still out there. He was then disconnected. A Hampton Police Department's blotter entry for that night reads: "September 3, 1965: 3 a.m. Exeter Police Department reports unidentified flying object in that area. Units 2, 4 and Pease Air Force alerted. At 3:17 a.m., received a call from Exeter operator and Officer Toland. Advised that a male subject called and asked for police department, further stating that call was in re: a large unidentified flying object, but call was cut off. Call received from a Hampton pay phone, location unknown." 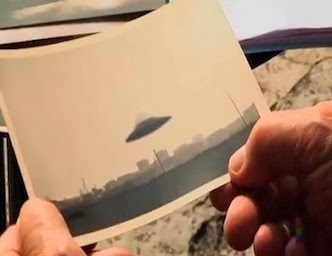 The official report to Project Blue Book from the director of administrative services of the Pease Air Force Base at Portsmouth concluded with this paragraph by the investigator: "At this time, have been unable to arrive at a probable cause of this sighting. The three observers seem to be stable, reliable persons, especially the two patrolmen. I viewed the area and found nothing in the area that could be the probable cause." Project Blue Book is a compilation by the U.S. government to repute the existence of extraterrestrial objects. Peter Geremia, New Hampshire state director of the Mutual Unidentified Flying Object Network Inc., noted: "The police officers involved put their careers on the line. They courageously came forward and stated what they saw at a time when witnesses were not allowed any credibility on the subject." Geremia, who has appeared on national media programs including "Unsolved Mysteries," presented chronological depiction of what happened the night of the Incident at Exeter. 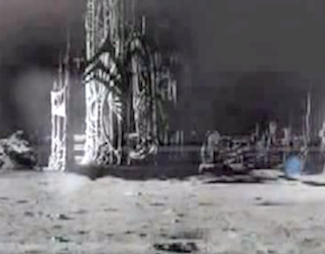 His "decent rendition of what happened" matches the series of events starting with Muscarello being frightened by a UFO. Bertrand, although an Air Force veteran, was never able to put a name to the UFO. "What do you call a UFO? Was it from another planet? We just couldn't identify it," he noted. He meticulously described it as a "huge, shapeless object with five sequentially pulsating-from-left-to-right bright red lights, so bright you couldn't look at it." 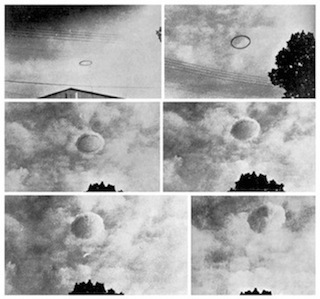 The Pentagon repeatedly denied the sightings, but the incident was read into the congressional record in April 1966 by Raymond Fowler, representative of the National Investigations Committee on Aerial Phenomena in Washington. It was the first open congressional hearing on UFOs. Fowler, internationally renowned author of 11 books about UFOs, has studied UFO reports for decades. In a recent interview, he shared his thoughts on the Exeter incident and the stories that followed. "The second-hand speculation stories were varied and perhaps hypothesized," Fowler said. 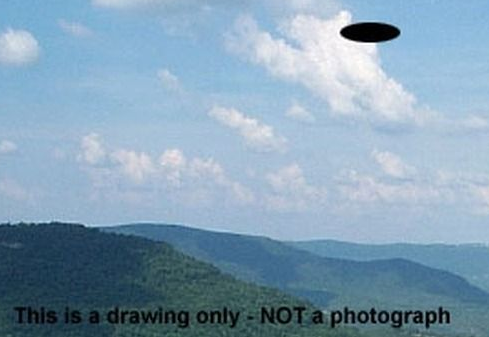 "Muscarello's mother purportedly saw confidential drawings of a UFO landing site pattern that was handcuffed to an Air Force investigator who visited her house. The neighboring farmer was instructed by the Air Force to plow under landing marks in his field. "The hens in the neighborhood stopped laying eggs. The air-base intelligence officer was seen buying up all the newspapers carrying stories about Sept. 3. A base commander was seen in civilian clothes rather than uniform while investigating," he related. Then, there was the irrefutable. "There were major similarities with these area sightings that conform to documented cases. UFOs tend to be seen near swamps, major power lines or nuclear sources. Muscarello noticed the object coming from over a line of trees behind which were major power lines. There was a swamp in the area. Pease and the Navy yard both had nuclear power entities. And, when a Pease Air Force base commander attempted to disprove it was a UFO by simulating the incident by turning on runway lights, he failed," noted Fowler. 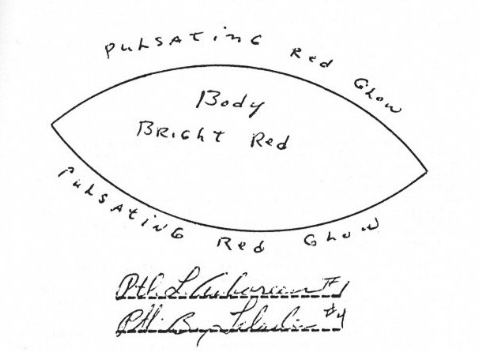 Fowler, now retired from active investigation, noted in a letter to the United States Air Force, "The UFO sighted by Norman Muscarello was identical to the UFO seen later by Muscarello, Bertrand and Hunt. "There is no question in my mind that the same or similar object was involved in both of these particular sightings. "Since I did not interview the unnamed woman, I am not certain of the details... but according to Officer Bertrand, the object... was very similar to the UFO they sighted later... another witness, a male motorist, also sighted a similar object..."
Because of the viability of the testimonies of those involved on the night of Sept. 3, 1965, and because of Fowler's testimony into the Congressional Record in April 1966, the United States Air Force admitted that indeed, the Incident at Exeter involved an unidentified flying object. Above is artist interpretation of the sighting. During the early morning of September 26, 1963, a UFO was sighted by people in scattered locations around the San Francisco Bay area. Paul Cerny, Chairman of the Bay Area NICAP Sub committee, conducted an investigation and located nine witnesses. (The sighting was reported September 26 in the San Jose Mercury News, Los Altos Times and the San Francisco Chronicle.) 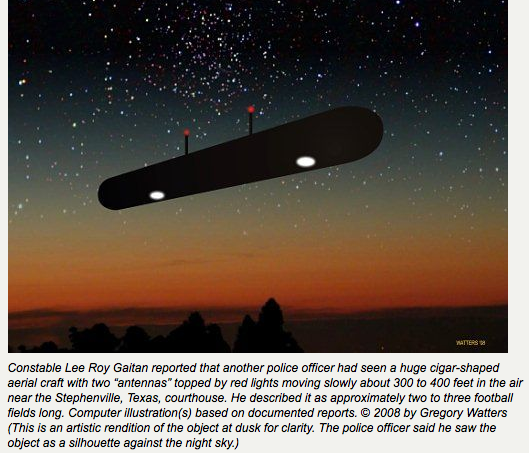 A particularly detailed report was obtained from officer Galen Anderson of the Sunnyvale Police Department, who observed the UFO for about 45 seconds. About 4:20 a.m., Officer Anderson was patrolling the streets in a squad car. A radio call from other officers alerted him, and he stopped to watch the UFO. The object was traveling from east to west at an elevation angle of about 45 degrees, at about the speed of a propeller-driven aircraft. 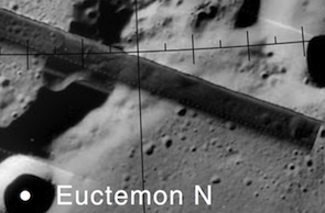 The leading edge was brightly illuminated, the main body grayish in color, with a small point of light visible on it. (See sketches and description prepared by Bay Area Subcommittee). The UFO then made a turn toward the northwest, was momentarily visible edge-on, then quickly disappeared from view. In nearby Monta Vista about 4:15 a.m., George W. Scott was on the job as a supervisor at the Permanente Cement Company. One of the work crew called his attention to a strange object in the sky, and he watched its flight for about a minute. To him, it appeared that the UFO stopped briefly each time the small body light pulsed, then moved 3 to 4 degrees between pulses. The UFO continued on a westerly course, disappearing behind the coastal mountains. 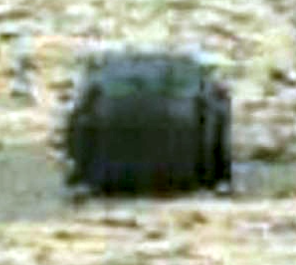 This object appeared larger than a full moon, according to Officer Anderson, about basketball size at about 8 feet away. 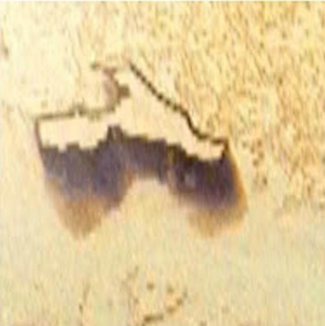 It appeared as a disc on edge, with about 3/4 or more of its outline showing. The trailing 1/4 of the circle, if it were there, appeared more or less invisible. Police Officer Lt. Haag told Anderson that he saw what appeared as heat waves in this quarter area and further to the rear. The disc appeared grayish in color except when the small spot of light ("A") lighted up about every 3 to 4 seconds. The color then changed to yellowish - white, some trace of orange, but predominately along the front leading edge portion ("B"). This produced a pulsing effect every three or four seconds. This, in turn. gave an eerie lighted haze or mist illumination of the area just outside the disc circle itself as if it were glowing or surrounded by a gas, or thin cloud, halo, etc. At each 3-4 second pulse, the small inner bright light would move around erratically to various new positions within the disc area. The object was visible about 45 seconds to Officer Anderson and traveled in a perfectly straight line over Sunnyvale toward Los Altos, then suddenly made a turn and was momentarily edgewise and vertical to Anderson's vision, then immediately disappeared from sight. Officer Anderson and Lt. Haag were only about a third of a mile apart at the time and Officer Girard was perhaps a mile to their northeast. Speed of the object was about that of a propeller driven military aircraft, elevation about 45 degrees from Officer Anderson, estimated altitude 4000-6000 ft., visible about 45 seconds. Brighter than full moon. A series of New Jersey police sightings after a reported disc landing in a reservoir -- important because police and several newspapers openly rejected an attempted "hoax" explanation. The action began on September 15. 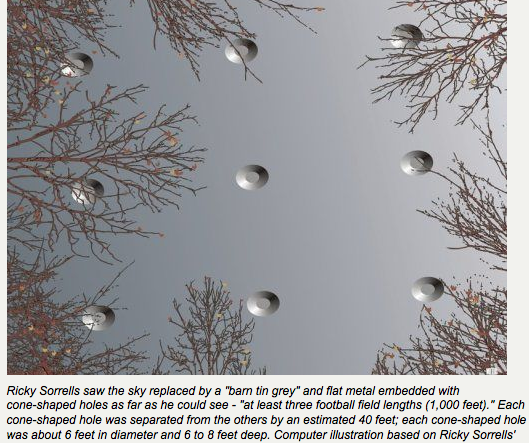 At 5 p.m., two shiny discs were seen over Oradell, N.J. At 6 p.m., two shiny round UFOs were sighted by former Navy flying officer J. J. McVickers, just across the state line. 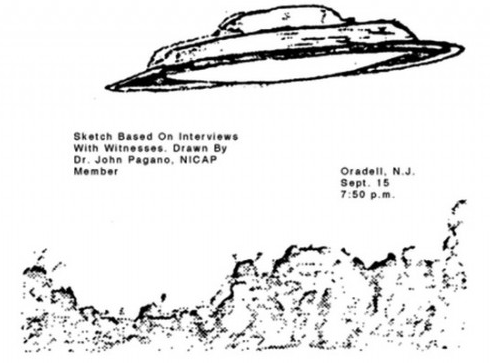 At 7:50, NICAP member Victor Cipolla saw a glowing object descend toward Oradell, and other witnesses saw it dart back and forth near the reservoir. At 7:55, three teen-aged boys saw a bright oval-shaped ob ject land in the reservoir, with a loud splash. A man working nearby also heard the splash, according to police. After a moment the strange device took off, climbed silently at high speed. The Newark Evening News, Science Writer Philip Del Vecchio. "It would have been impossible for them (the Bergen County boys) to put their model planes so high that they could be seen in Hawthorne... No object such as they could have put together could have moved at the lightning speeds attributed to the UFO. The light.., could not have been produced by amateurs. This newspaper makes an appeal to other residents ...with the assurance that reports will be treated with dignity. The Hawthorne Observer, rebuking those who accepted an unsigned letter from a town miles away, said it was time to treat the reports seriously. The Riverdale Sunday Trend: "Suppose the real hoax is the letter purporting to explain the whole thing?" The Hawthorne News Record: "To imply so flippantly that our police officers spent almost half an hour looking at a balloon and then watched it speed away at an incredible rate -- all in quite an opposite direction from Oradell--is insulting." The Newark Sunday News: "Flying saucers are still a big mystery...are seen with great regularity by sane and logical inhabitants of the planet Earth. What they are and where they come from and what their mission is has not yet been satisfactorily explained." Regardless of the final outcome, these New Jersey sightings have shown that an increasing number of newspapers no longer accept quick brush-off answers to sightings by competent witnesses. At this time it was clearly visible to both of us. It was surrounded by a glow making the round or oblong object visible. At each end, or each side of the object, there were definite red lights. At times about five white lights were visible between the red lights. As we watched the object moved again and performed aerial feats that were actually unbelievable. The officers radioed the Tehama County Sheriff's Office and asked Deputy Clarence Fry to contact the local Air Force radar station at Red Bluff. Deputy Fry reported back that the radar station verified that an unidentified object was visible on radar. On two occasions the object came directly towards the patrol vehicle; each time it approached, the object turned, swept the area with a huge red light. Officer Scott turned the red light on the patrol vehicle towards the object, and it immediately went away from us. We observed the object use the red beam approximately 6 or 7 times, sweeping the sky and ground areas. The object then began to move slowly to the east, and the officers followed. When they had reached the Vina Plains Fire Station, the object was approached by a second object that came from the south. The second object moved near to the first and both stopped and hovered for some time, occasionally emitting red beams. After a time, both objects vanished below the eastern horizon. They had observed the first object for a total of about two hours and fifteen minutes. When they returned to the Tehama County Sheriff's Office, they found that the object had also been seen by Deputies Fry and Montgomery, as well as by the night jailer. All described the same thing. 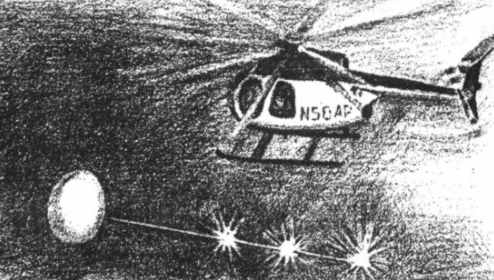 The next day, Officers Carson and Scott drove to the Red Bluff Air Station to discuss the sighting and to speak to the operator that had seen it on radar. The Air Force, however, now denied that the object had been seen on radar, contradicting what the radar operator had told Deputy Fry the night before. The visit was completely unproductive. 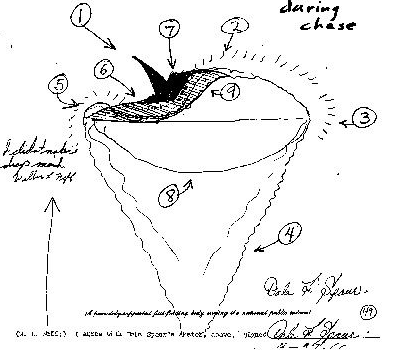 More information regarding the sighting was obtained by NICAP(National Investigations Committee on Aerial Phenomena) advisor Walter N. Webb, who contacted Carson and received a copy of the report, drawings of the object, and a letter from Carson. We made several attempts to follow it, or I should say get closer to it, but the object seemed aware of us and we were more successful remaining motionless and allow it to approach us, which it did on several occasions. Each time the object neared us, we experienced radio interference. The object was shaped like a football, the edges, or I should say outside of the object were clear to us...[the] glow was emitted by the object, was not a reflection of other lights. 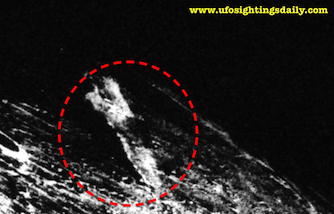 What was the "official" explanation for the sighting? In a letter to a NICAP member, the Air Force said: The findings [are] that the individuals concerned witnessed a refraction of the planet Mars and the bright stars Aldebaran and Betelgeux. . . [temperature inversions] contributed to the phenomena as the planet Mars was quite low in the skies and the inversion caused it to be projected upward. A contributing factor to the sightings could have been the layer of smoke which hung over the area in a thin stratiform layer. This smoke came from the forest fires in the area hung in layer due to the stable conditions associated with the inversions. When NICAP pointed out that Mars, Aldebaran, and Betelgeuse were all below the horizon at the time of the sighting, the Air Force changed the star involved to Capella, which was slightly above the eastern horizon at the time. They neglected to explain the fact that, as the sighting progressed, Capella would have risen in the sky, whereas the objects disappeared below the eastern horizon at the end of the sighting. ...I have been told we saw Northern lights, a weather balloon, and now refractions. …I served 4 years with the Air Force, I believe I am familiar with the Northern lights, also weather balloons. Officer Scott served as a paratrooper during the Korean Conflict. Both of us are aware of the tricks light can play on the eyes during darkness. We were aware of this at the time. Our observations and estimations of speed, size, etc. came from aligning the object with fixed objects on the horizon. I agree we find it difficult to believe what we were watching, but no one will ever convince us that we were witnessing a refraction of light. A check of the meteorological records of the area for that night by atmospheric physicist James E. MacDonald failed to find any evidence that would indicate the presence of a temperature inversion. Over the next week, similar sightings were reported, including another sighting the very next evening by Deputies Fry and Montgomery that was also seen by a Corning police officer. December 19/20 of 1958 was a cloudless night in Dunellen, New Jersey. At 12:55 a.m., Patrolmen LeRoy A. Arboreen and B. Talada were on night patrol, cruising west on Center Street. From an area elevated about 15 to 20 feet they had an unobstructed view to north, south, and west. "This object came at us from the west. At first it looked like a red hot piece of coal about the size of a quarter held at arm's length. In a matter of seconds it was as large as a ruler held at arm's length. That is when it came to a complete stop. "The shape of the object was distinct. (See illustration.) 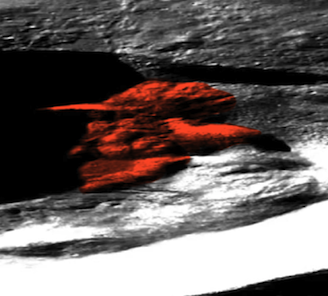 The body of the object was solid bright red and it gave off a pulsating red glow completely around the object. The object hovered a few seconds, then made a left turn and again hovered for a few seconds, then went straight up like a shot. We watched it until it completely faded beyond the stars." In this matter-of-fact manner, the two officers described an occurrence which is totally inexplicable. Meteors do not hover or shoot upward. No known aircraft is elliptical, and glows bright red in flight, not to mention the observed performance.